The running/lifestyle blog of a fitness-obsessed, IPA-drinking lawyer in LA. Happy Monday everyone! I thought I didn’t have anything blog-worthy going on and then I forgot that I am really good at being over-dramatic and hyperbolizing things. Alas, a blog post was born! 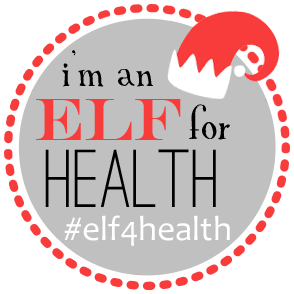 Today is the first day of #Elf4Health — a healthy living challenge taking over the blogosphere (hosted by Lindsay @ The Lean Green Bean and Elle @ Nutritionella). 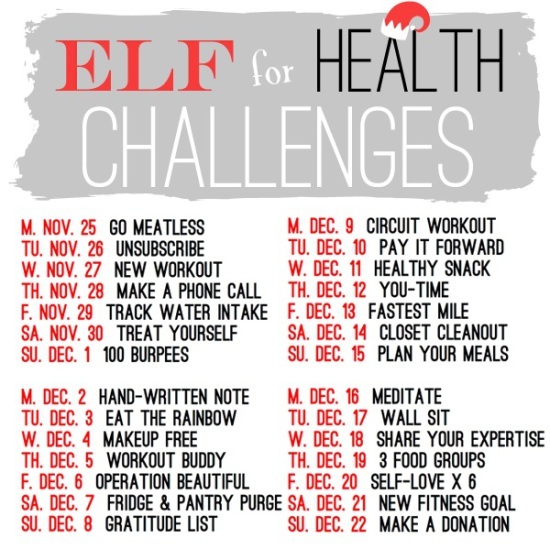 The four-week challenge includes a task or goal for each day, and we have two different “elves” we’re matched with (each one for two weeks). Today kicked things off with “Meatless Monday.” I was at school almost all day (finals season), so my cooking “skills” didn’t get to shine, but I can’t wait to try some of the recipes I’ve seen floating around. 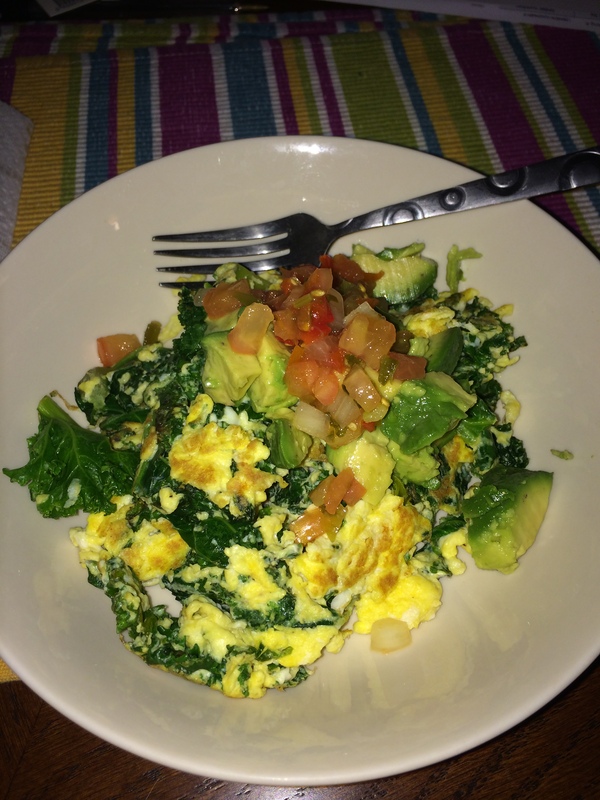 Speaking of meatless Monday, this is my latest obsession: three eggs scrambled with some kale, topped with avocado and pico de gallo. Get in my belly. It has been fun starting to get to know my “elf,” Nicole @ Fruit ‘n’ Fitness, as well. I’m looking forward to “unsubscribing” tomorrow — I get SO much junk mail and love Cori‘s idea to use a website called unroll.me. In other news, I was the lucky winner of Whitney’s #Movember contest over at To Live and Diet in LA. 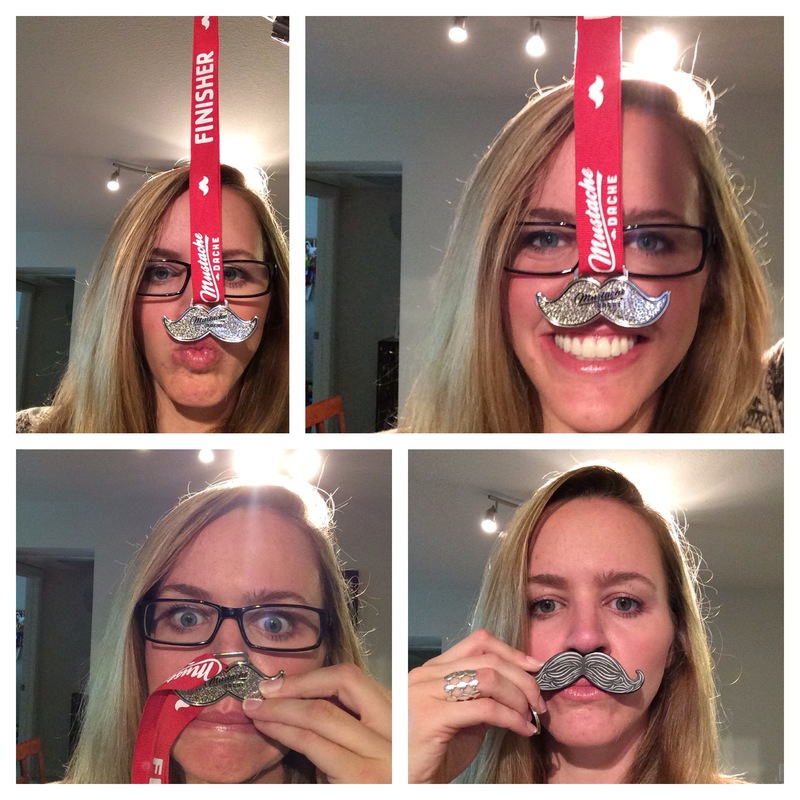 I showed off my Mustache Dache medal, made a dork of myself, and get to go to heaven Soul-Cycle for free! Thanks, Whitney! anything in the name men’s health and tapping. it. back. On Saturday, my 7:30 alarm came mighty early — Friday night consisted of my final trial in my Trial Advocacy class, a fabulous dinner with Aviva at Little Bear, and celebrating my roommate becoming a member of the CA bar! 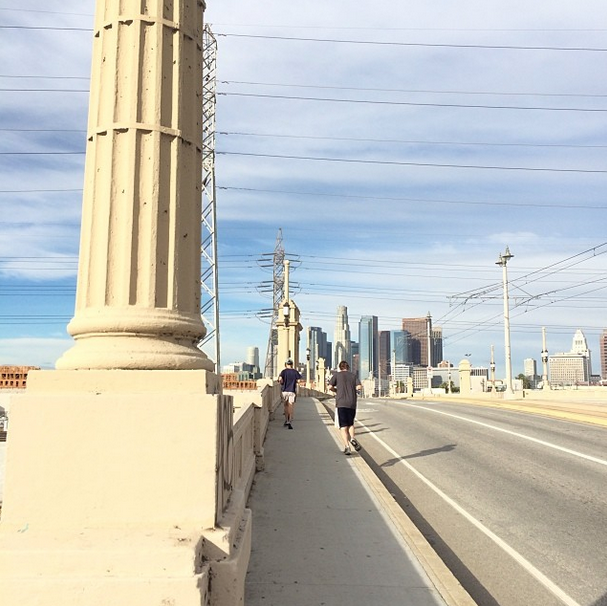 I started the day by leading my DTLA running group in a 6.5 miler. We met downtown, headed out to Boyle Height’s Mariachi Plaza, and high-tailed it back. We ran at about an 8:10-8:15 pace which was fun and relaxed. Noel snapped this great show on the 1st Street Bridge. After my run, I scarfed down some oatmeal (with peanut butter + chocolate protein powder, a.k.a my daily staple) and headed out to teach a little spin. I LOVE when the class is full, the regulars are there ready to work hard, and people sing along. I delayed starting the Wills & Trusts outlining fiesta by actually blowdrying my hair for once and taking a selfie. The real star of this show is obviously my new iPhone. After logging 4+ long hours in the library teaching myself a lot of boring things, I picked up my friend Aviva and met my parents at a West Hollywood institution — The Troubadour. My brother manages a band, Dewey and the Peoples, and they had a show there on Saturday (along with Cisco Adler and Radical Something). The show was a blast and I had a great time. It was also great to see my brother in his element. On Sunday, I logged some hours in the gym with body pump + spin, back to back. I love the regulars at my gym — they fill me in on the gossip and joke around, and push me to work harder. A new friend of mine from law school happened to be in class so she suggested we grab smoothies at Juice Crafters afterward. I’m all about refueling post-workout, and often opt for a smoothie from my gym’s smoothie bar (my favorite has banana and peanut butter, duh), or make the legendary Green Monster at home. Juice Crafters was pricier, but delicious. I opted for the “Lily w/ Strawbs” which consisted of fresh strawberries, almond milk, dates, granola, walnuts, and probably something else delicious I am forgetting. I spent the rest of the day hanging out at school — it is finals time. The last two years I have been crazy-diligent about being on top of everything, but I have slacked more this semester. I have two finals in early-mid December, so the next few weeks is Operation: Learn Everything I Should Have Been Learning Since August, and Haven’t. Have you ever done an internet/blog/twitter “challenge”? could I be any more LA? I realized the other day that I was “so LA” when I was out to dinner with my friend/neighbor/walk-to-work buddy Peter and his new roommate, Fadi, at Sugarfish (the best sushi I’ve ever had). My schedule this year is really laid-back (#3LFreeL or #3LOL will be used a lot in the next year), so I have a lot of time to do fun things and generally be obnoxious. In between bites of halibut, Peter asked me what I had planned for the next day. This was my response: “Well, in the morning I’m going on a #SOULDate with my friend Katherine. We met through each other’s respective blogs and became friends in real life. 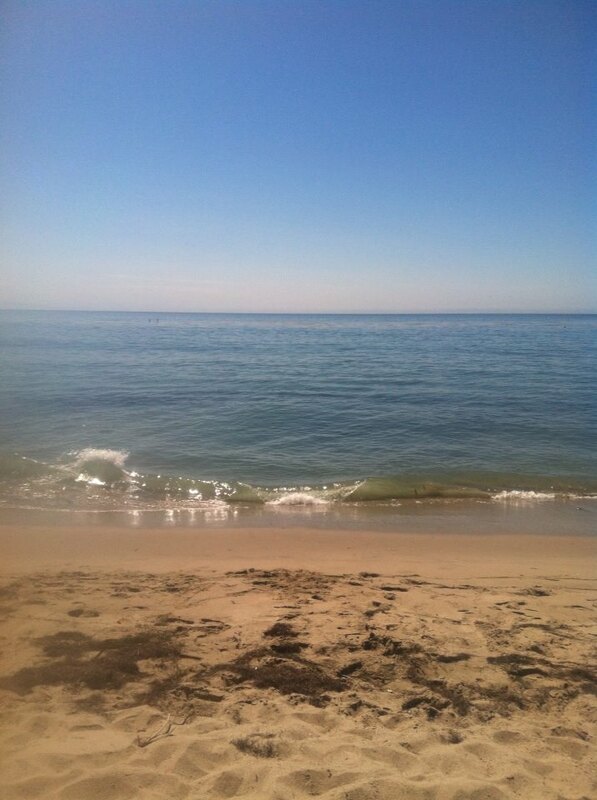 And then later that day I’m meeting a law school friend in Malibu to do some snorkeling.” It then dawned on me…I could not, if I tried, be any more “LA.” HOW DID THIS HAPPEN. 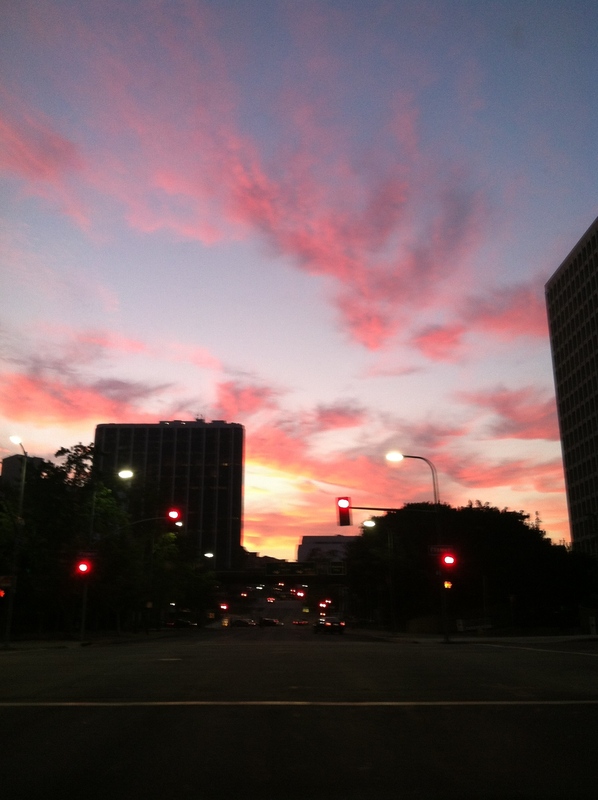 Whatever, LA is the best. 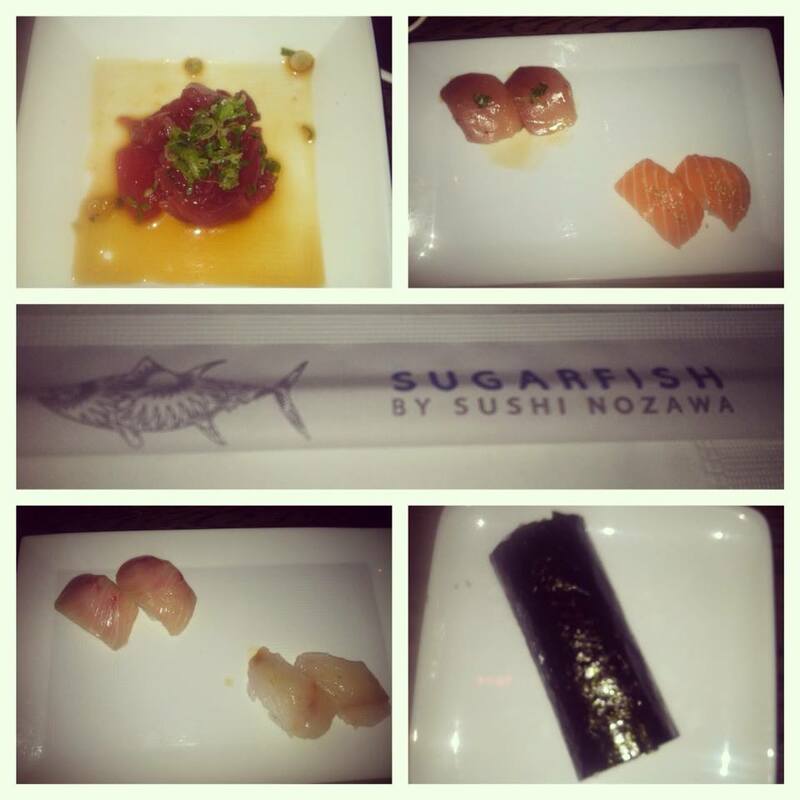 Sugarfish was incredible. I am new to delicious sushi. I only really realized I liked it in the last few years – I used to be weirded out by the idea of eating raw fish, and before that I didn’t even like COOKED seafood. I ordered the $30 fixed-price meal called the “Trust Me.” All of it was delicious, but the halibut was my fav. The next morning, I set my alarm for 7 to make it to Soul Cycle in Santa Monica to meet Katherine for the 8:30 class. I left at 7:35 and got there an HOUR later, walking into the class a solid 10 minutes late. As heartbreaking as that was, I enjoyed the class and liked the instructor, Molly, a lot, although she’s no Laura Crago (mine and Katherine’s fav ever). Katherine and I grabbed coffee after and she filled me in on super important (not sarcasm) healthy living blog gossip. Although I joke about my LA hobbies (spinning, blogging for two) I love the fact that my blog and social media obsession has allowed me to get to know people and make real friends! Katherine and I have gone spinning together at least 4-5 times now and have definitely become friends in the process. One of these times we’ll take a photo together – but post-spin is never when I am looking my greatest. Anyway, Soul Cycle is the best. After our spin fest, Katherine and I parted ways and I drove down PCH a little to meet one of my law school budz, Taylor, at his parents’ house. He has all kinds of weird hobbies, the latest being spear-fishing. Since we both don’t have Thursday class, I jumped at the chance to snorkel/be in the water while he tried to kill some stuff. Multiple victories were had: I fit into a wetsuit made for a tiny child, I saw a bunch of fish and MULTIPLE seals, and Taylor did not puncture me with his harpoon. Yay! The visibility wasn’t awesome as the day went on so no fish tacos were consumed, but all in all it was great to be out there! 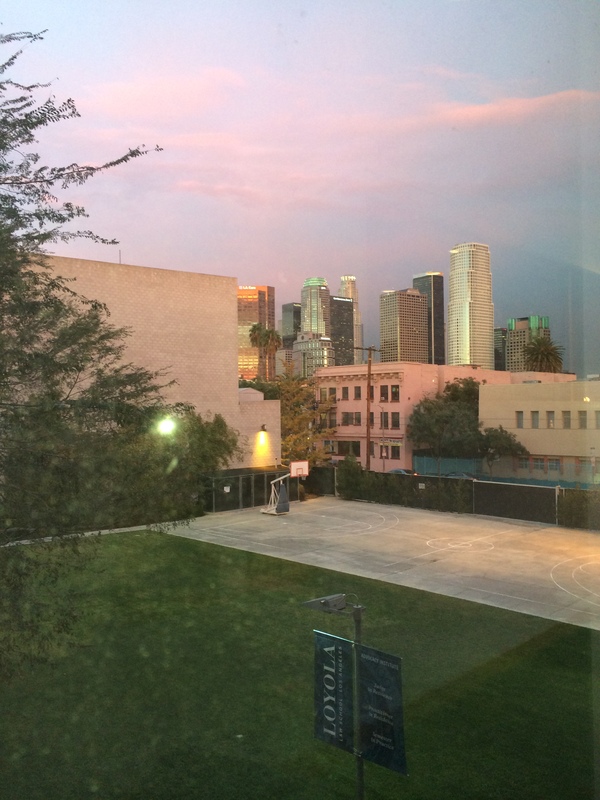 I left the ‘Bu and headed back to DTLA where Loyola was having its first “Turf Club” of the year. Yes, I went to school by choice when I didn’t have class, but it was because they were literally giving out free beer. And, as my friend Ross pointed out, they weren’t keeping to the prior “two drink” minimum. Beers were had and “networking” was conducted. A win for all! Also – HUGE upgrade on my law school’s part for switching from Coors Light to Golden Road’s Hef this year for a beer option. Clearly my priorities are in order. Other “LA” things I’ve done recently include seeing the Dodgers lose (sadly) to the Red Sox last Sunday, and going on a run to U$C with my running group. Although I didn’t go there, running a couple of laps around their track is pretty magical. Eww did I just say that? My status as an annoying social media…enthusiast was revealed today when I went to pick up a package for my subscription-box obsessed roommate. (She’s on vacation and has 4 boxes of loot waiting for when she gets back. Everyone has their vices. I am not judging). Anyway, there was a package for me too – my own bag of loot c/o Klout! 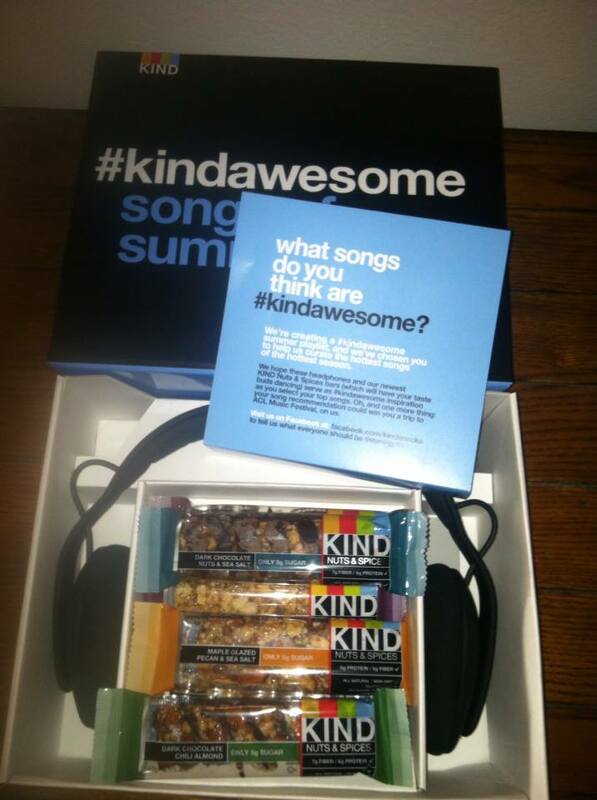 KIND bars sent me a bunch of bars to sample and INCREDIBLE high-quality incase brand headphones. I will never use earbuds again for anything other than running. That’s about all the news I have. I’m off to sub a spin class in a couple of hours and then beat the heat by (probably) listening to Miley Cyrus “We Can’t Stop” remixes at length. Oh, last thing, I binge-watched Orange is the New Black in the last week after making fun of my mom for doing the same thing. SO good. And of course, someone told me I look like Piper Chapman so now I have completely internalized the show. The other day I thought I saw Crazy Eyes on my run to SC. Nope, Gillian, you are not Piper Chapman, the show is fictional, and fake prisoners are not roaming the streets. Have a great Labor Day weekend y’all! Fav LA stereotype? I probably embody it, let’s be real. 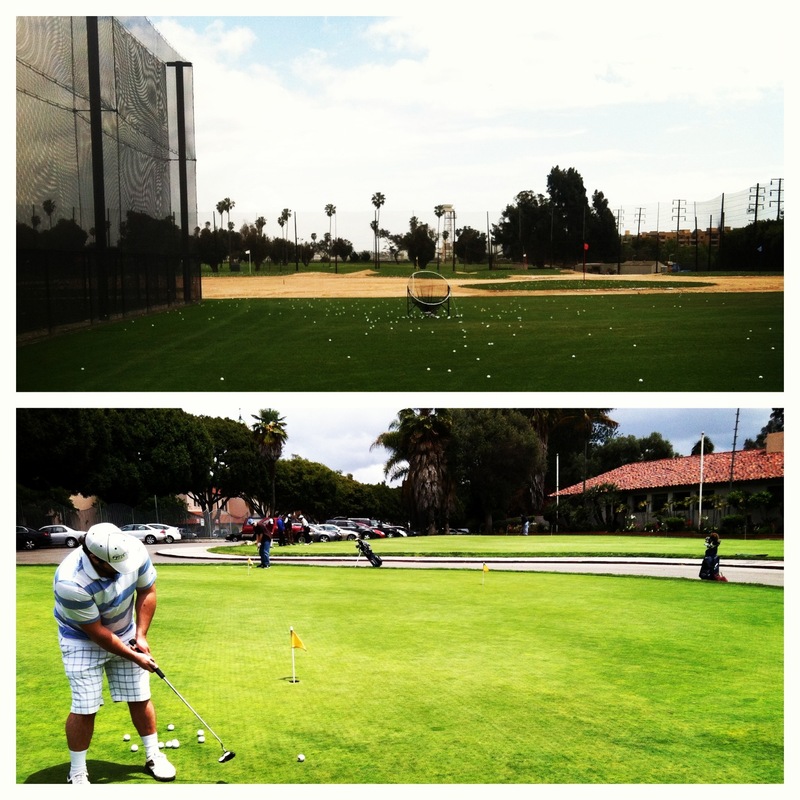 I’ve been pretty busy this last week since the OC Half…but fun busy…even if I had to study and take a final. The day after the race I suffered through some soreness and went golfing for basically the first time ever with my buddy Taylor. I wasn’t great, but I actually hit the ball okay a few times. 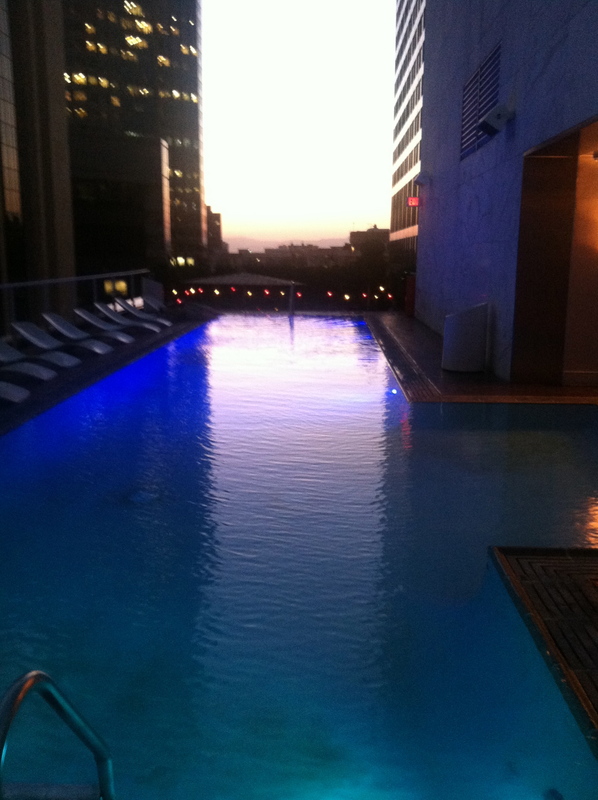 Also last week, I activated a one-month membership at Equinox DTLA that I received free from a Klout Perk. I signed up, got a tour, and a bag/T-Shirt. As part of my perk, I also get a complimentary session on a pilates reformer, which I’ve never used before. So far I’ve taken a couple of yoga classes as well as a spin class. I also love the fact that the treadmill has a virtual reality course so you feel like you’re (almost sort of) running outside. I’ll do a full review of the gym when I’ve used up my month long membership, but I am going to try as many classes as I can. 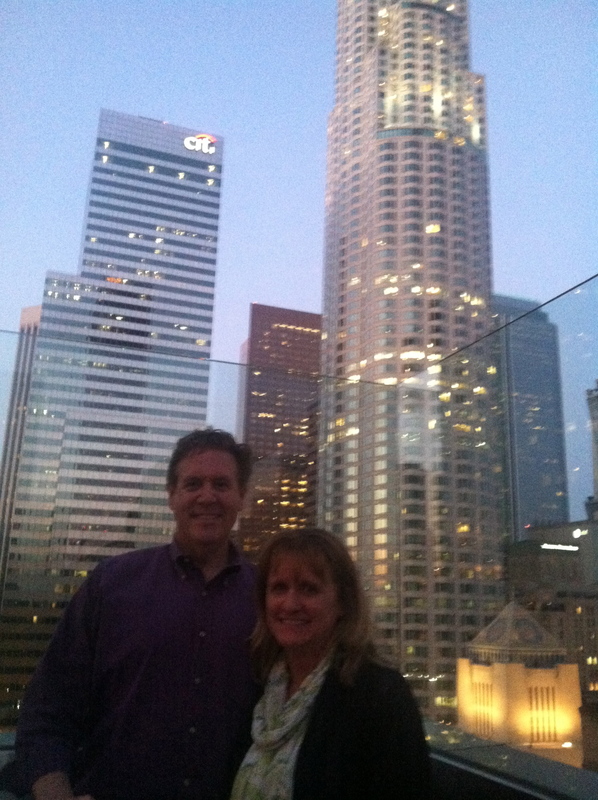 On Friday, most of my friends were studying, so I hit up my parents to grab dinner with me at The Standard Rooftop. 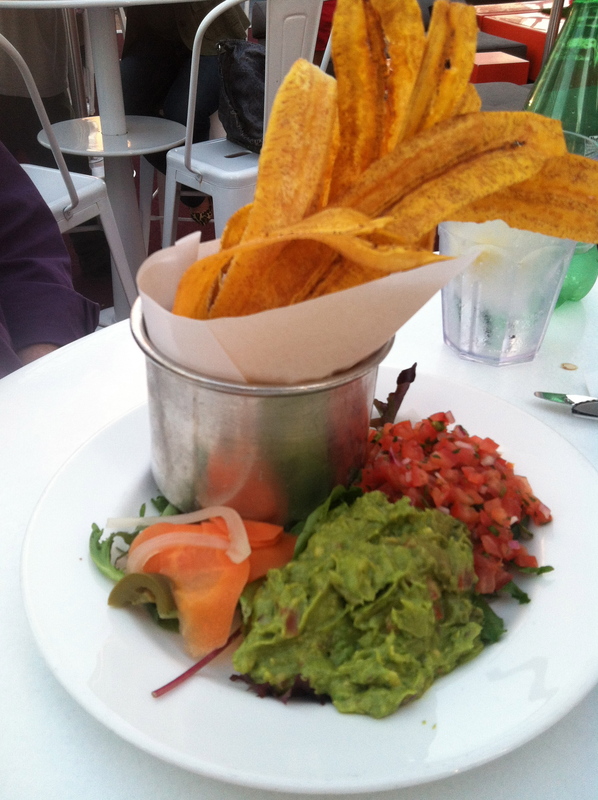 Plaintain chips & guacamole was the best thing ever. 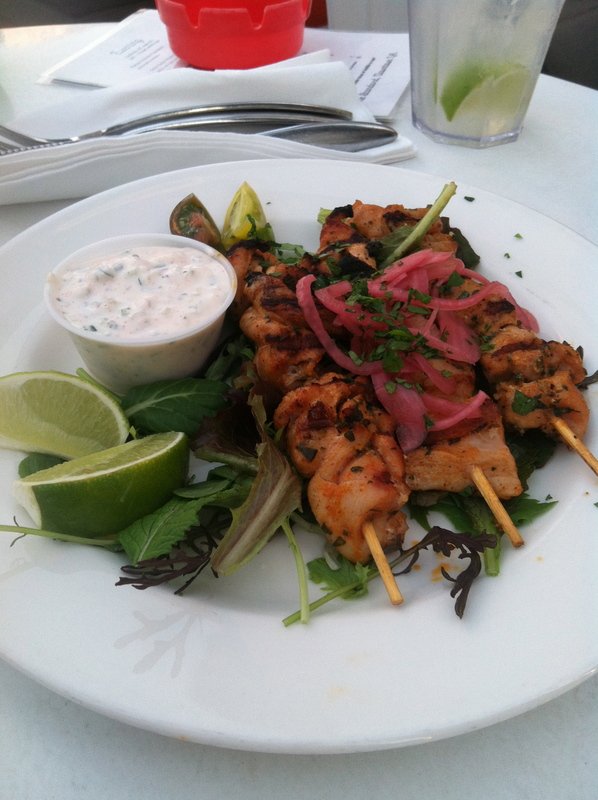 We also noshed on chicken skewers and bacon-wrapped shrimp. I also squeezed in some studying. With only one final this semester, spreading out studying for one class over two weeks was sort of hard – every day I felt like I wasn’t doing enough, but I probably studied more for this test than I would have had I been on a more traditional finals schedule. On Saturday morning, I met up with Whitney at SoulCycle SAMO for a ride. It was so great to shake the remaining soreness from the half out. We rode with Gina, who I liked, but she told the class “I love you” over 10 times which sort of weirded me out. On Saturday evening, I headed home to spend Sunday with my family for Mother’s Day. On Sunday, I decided to run 20 miles. Yep, you read that right. 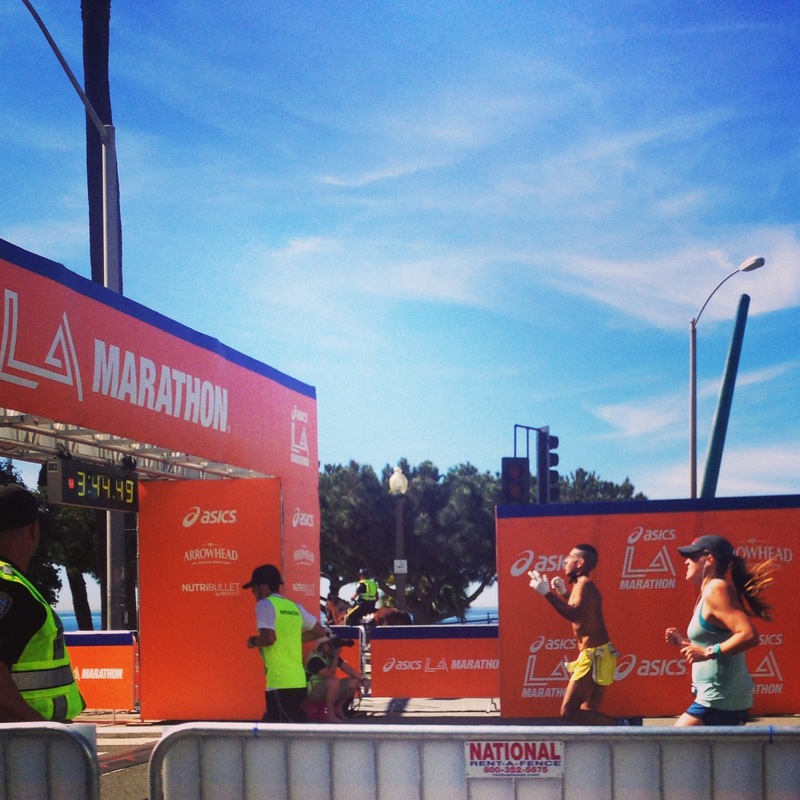 I have been wanting to do a full marathon for awhile – and wasn’t able to do LA when I trained for it due to messed up hips/IT band/knee. I figured if I could get in one really long training run of 20 miles, I could conceivably do Rock N Roll San Diego on June 2. Last week’s half went well (and decently fast), so I mapped out a 20 mile route, and roped in my friend Hannes to run it with me. We started at my house at 6 am. At mile 8, my Dad met us (near Westlake Lake) with gels and water. My focus the first 8 was just to maintain a good pace and not go to fast. Hannes and I chatted until about mile 10, when we put music on. 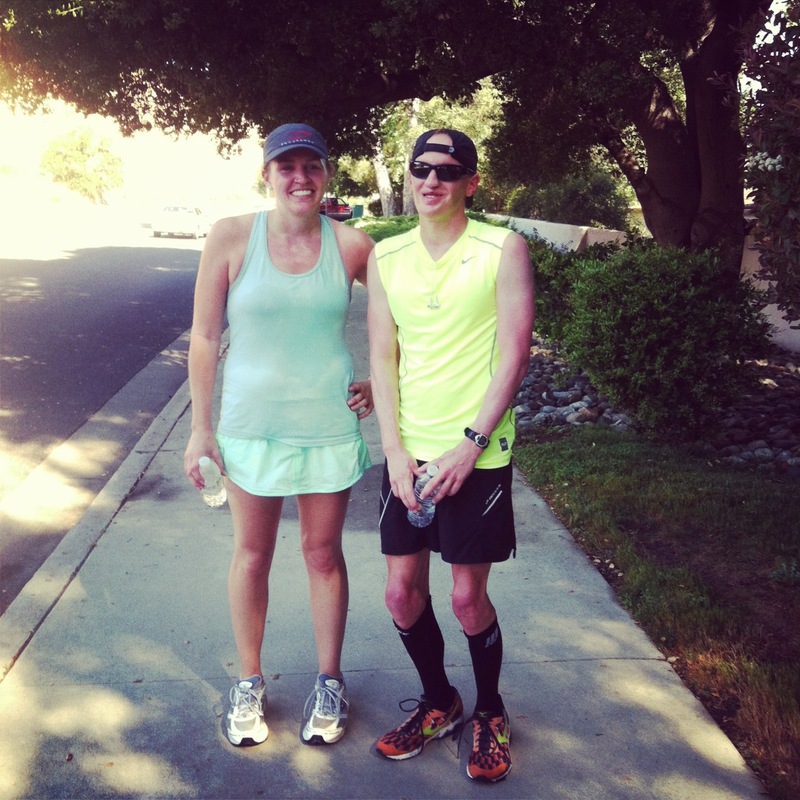 Miles 10-14 were spent running up to and around Lake Sherwood, which was HILLY but gorgeous. Again, at mile 14, my Dad met us to refuel, and I slipped a hat on. The last few miles were sort of tough, but we did it. We ran 20 miles in about 2:40, so while I am nervous for 26.2, I am confident I can do it. I took a gel/gu every 45 minutes, and wore what I plan to wear on race day. Side note: I used to think running skirts were dumb, but in fact this is THE most comfortable thing I’ve ever worn while running. Also, how dorky/cool are my socks? 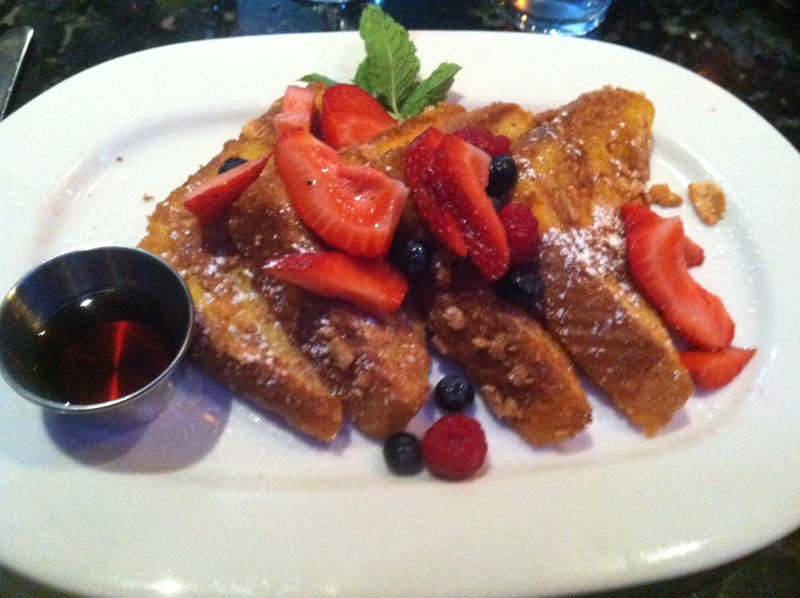 After running, stretching, showering, and lounging around, my parents and I headed to The Lab in Agoura Hills for brunch. 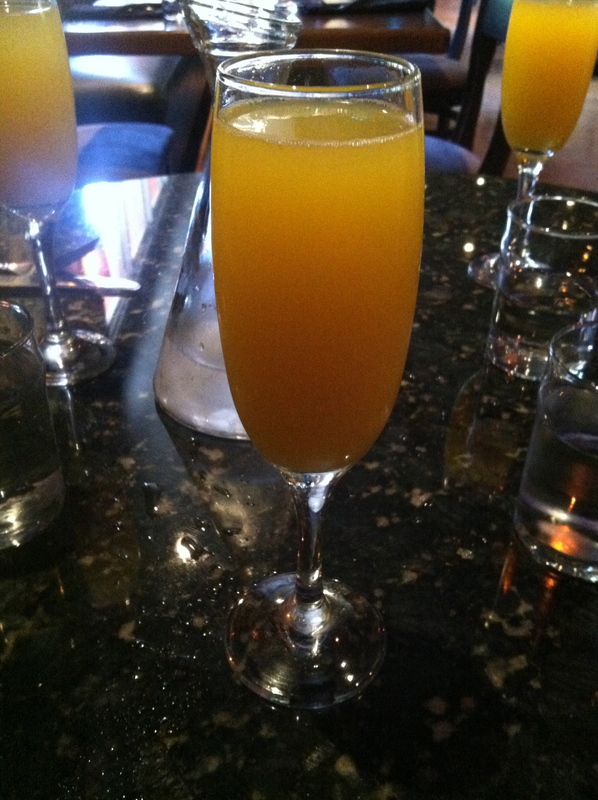 Mimosas were imbibed. And Cinnamon Toast Crunch French Toast was consumed. #bomb. My recovery has been great. My knees and hips felt a little sore, but I have tried to make a commitment to do way more yoga between now and the marathon. I took a class at Equinox yesterday and pigeon pose felt amazing. Oh yeah, on Monday I took my final in Evidence. It was fine – just longgggg. 4 hours: 65 MC questions and “one” essay – one fact pattern, but 5 pieces of evidence we had to analyze. The exam started at 12, went til 4, and we’re not allowed to bring in food or water. So you better believe that I was starving. First stop after? 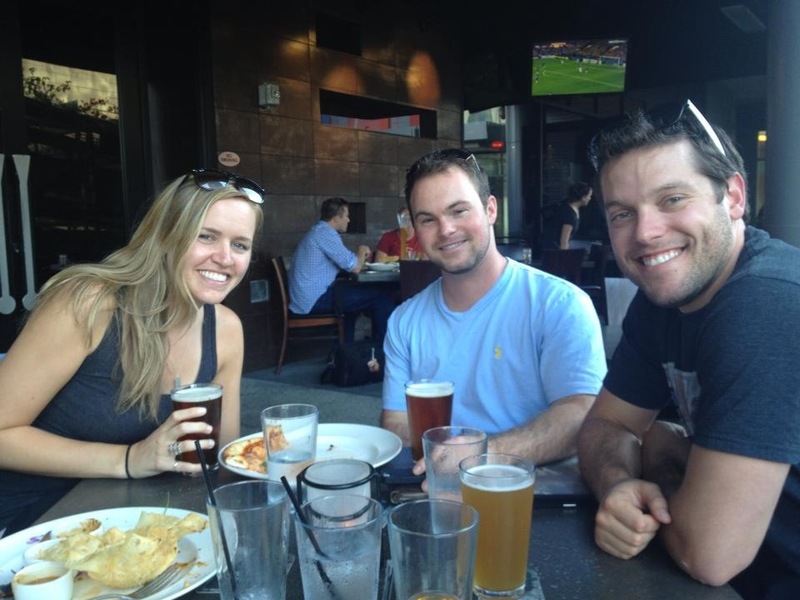 Yardhouse…obviously. Also on Monday…I officially committed to the 26.2 distance…SOON. I’ll be running my first full mary on June 2. Nervous/exited/will be yoga-ing non-stop until then. I’d love any marathon tips/tricks/advice any of you may have! Yesterday I was able to meet up with Katherine for a #SOULDATE at Soul Cycle SAMO. We took a class with Laura Crago, who is by far my favorite instructor. She’s a BEAST, has the best music, and is super motivating. Loved her class. Afterward, Katherine and I caught up over brunch at Huckleberry. 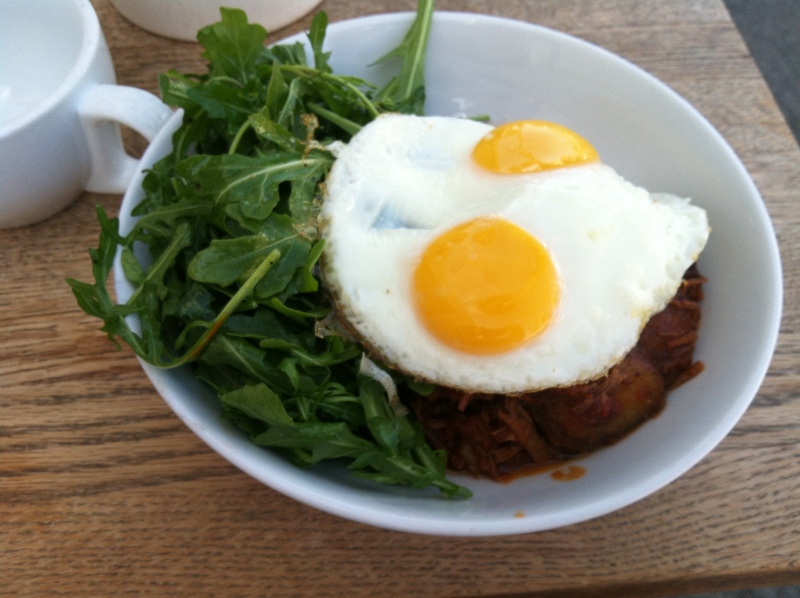 We both ordered this super-savory brisket hash served with arugula and two eggs. So good. 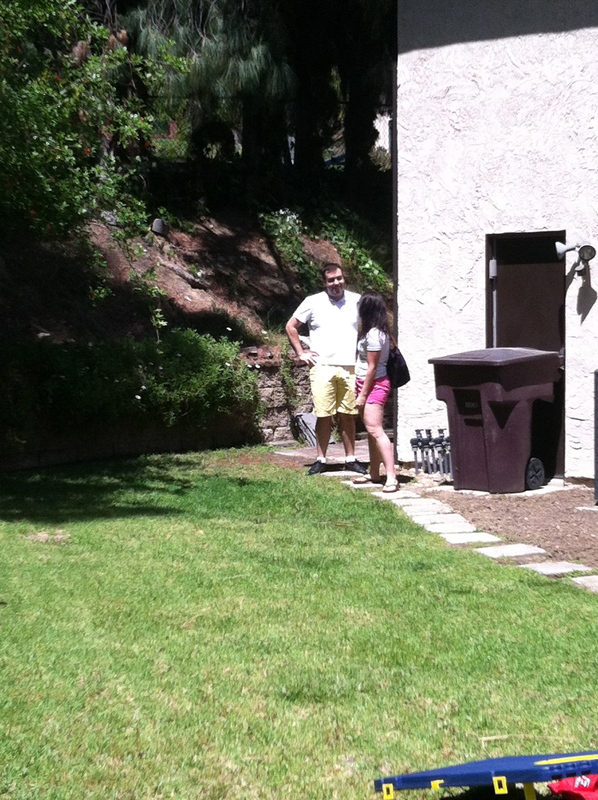 It was so nice seeing Katherine! We first met a little over a year ago and have caught up every few months. Proof that meeting people from blogging really is a thing. The rest of the week I will be lounging, working out, and relaxing before I start my summer job on Monday. Hit me with your best marathon advice! weekend recap [with text this time]. I lieu of working out for a second time today (I have a half marathon on Sunday…I realized two-a-days are a recipe for an injury), I decided to actually recap my weekend. 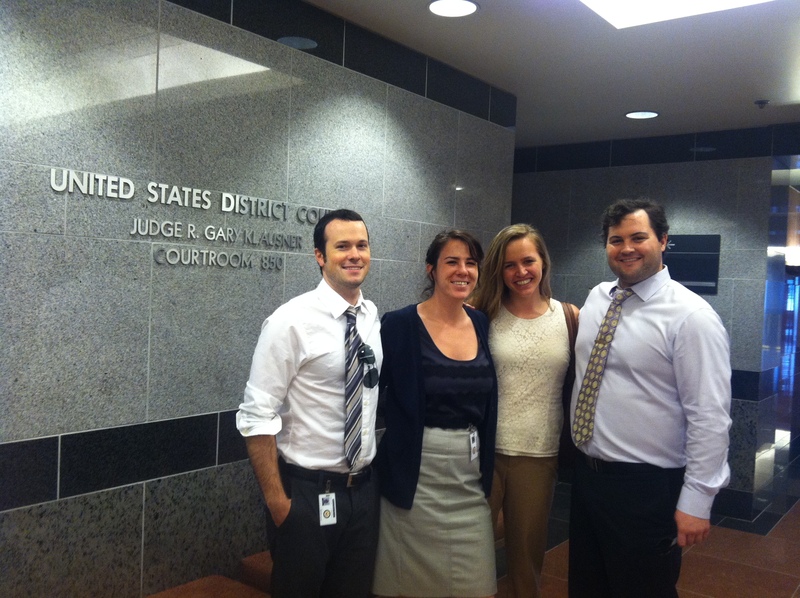 On Friday, my externship at the U.S. District Court – Central District of California (Judge Klausner) came to an end. We had a great last day – Ben and I concocted some pretty clever thank you notes for the clerks, and we went to a great last lunch with our clerk Tiffany at Spring Street Smokehouse. [Sidenote: Spring Street Smokehouse is my second favorite place I discovered during the four-month externship. My favorite is Little Tokyo’s The Sandwich Smith]. 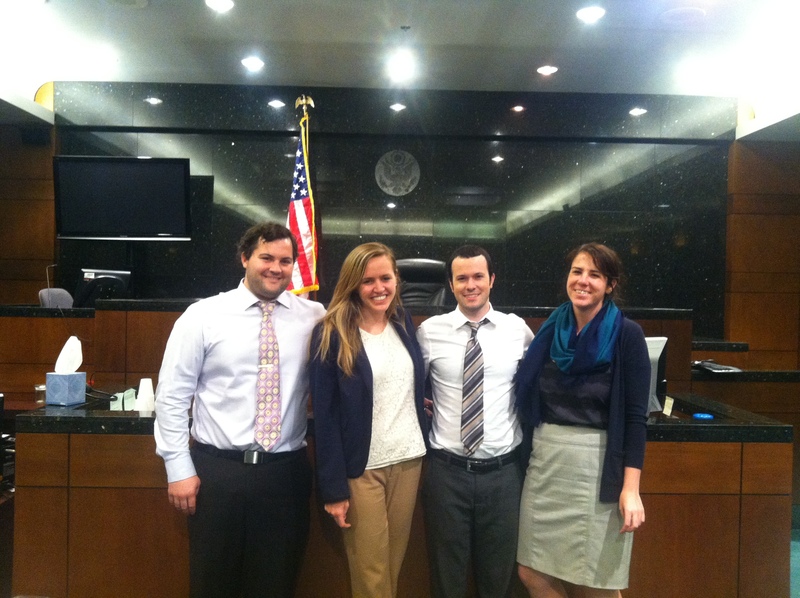 We finished up some last assignments, had our formal reviews, and said goodbye to the Judge and his staff.
. . . and we took photos in the courtroom. Sitting on the witness stand was pretty cool. I may actually miss these guys. 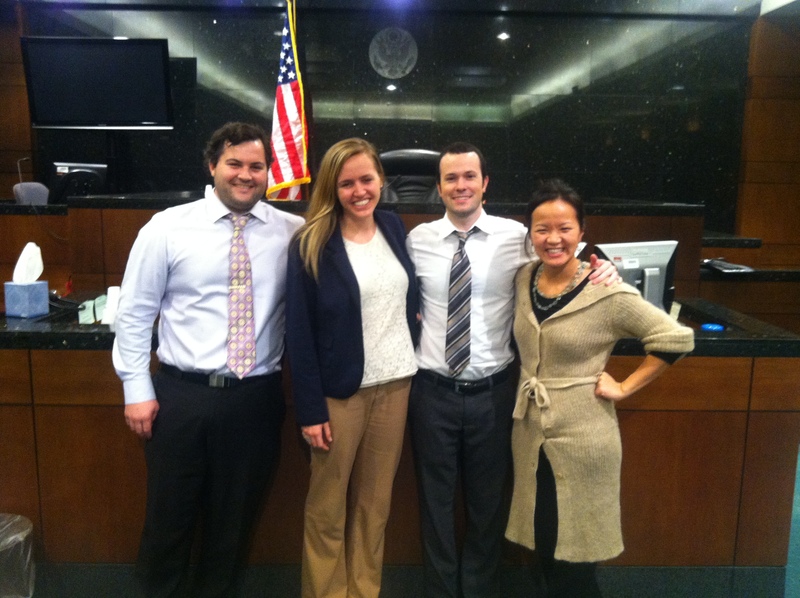 taylor, me, ben, and our clerk Tiffany. 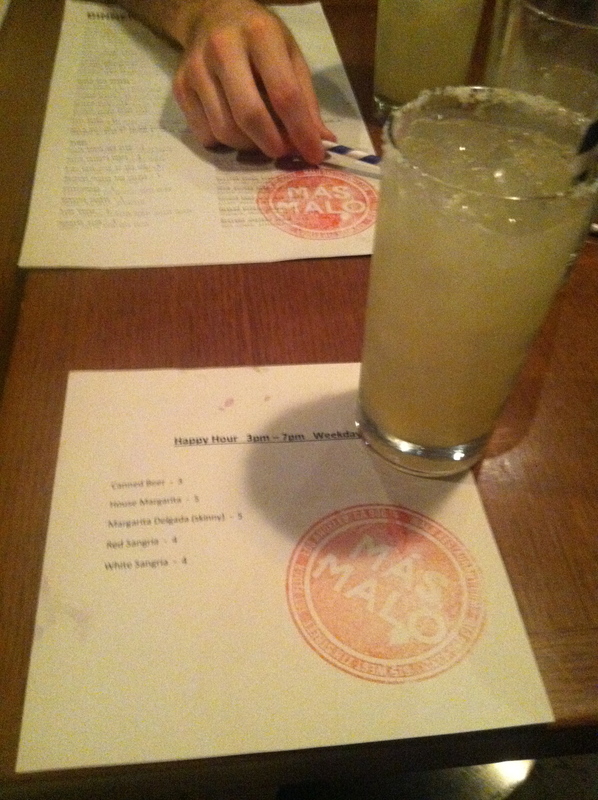 After work, we celebrated with a little happy hour action at Más Malo. On Saturday, I ran a little over 4 miles with the DTLA running group, ran some errands in DTLA’s Jewelry district (read: I shattered the crystal on my watch on Thursday…luckily Sam’s Jewelry and Watch Repair got it fixed in two days for $35). After some errands, I headed out to Glendale to my roommate Jenn’s parent’s house where she was hosting a surprise birthday party for her boyfriend, Daniel. 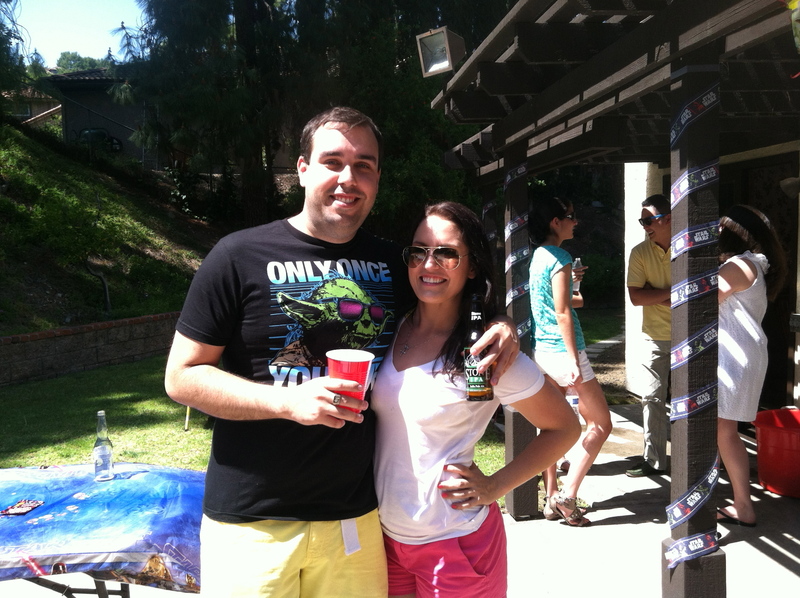 It was a gorgeous, sunny day and we all had a lot of fun drinking beer, dominating at beer pong, and playing a little corn hole. My parents met me downtown for dinner – we went to a place I’ve been wanting to try called Industriel, which bills itself as Urban French Farm cuisine. 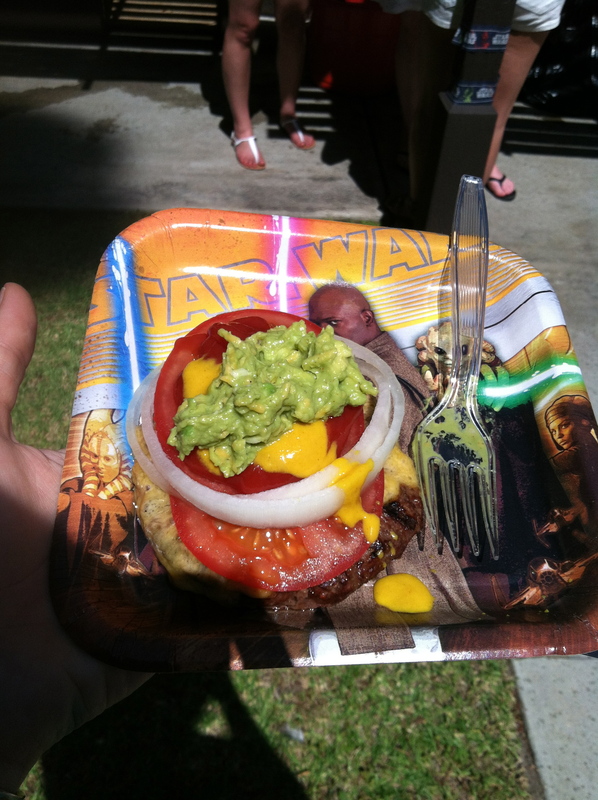 Everything we had was innovative, interesting, and we licked our plates clean. 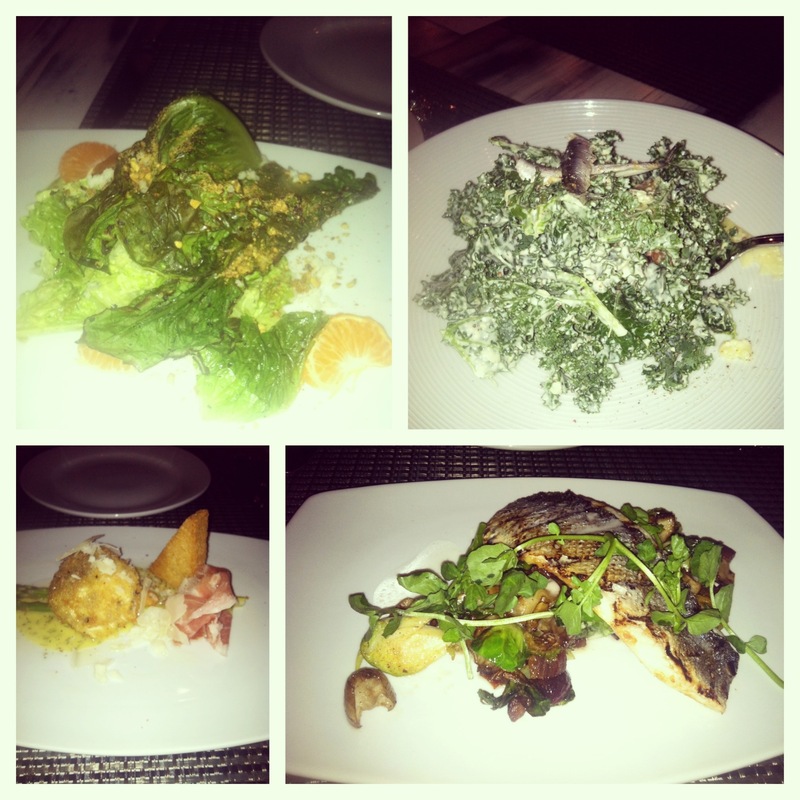 We had a charred romaine hearts, a kale salad, a poached egg, and the sea bass. My parents also dropped off this console table I am obsessed with it. I have a walkway between my new room and my bathroom that had room for a little table. My mom found this on Craigslist – but it was sold…#sadface. Using the powers of the internet, she found it elsewhere online, had it shipped, and brought it to me. Awesome mom award goes to…my mom. I am going to pay her back though. I’m not that spoiled. 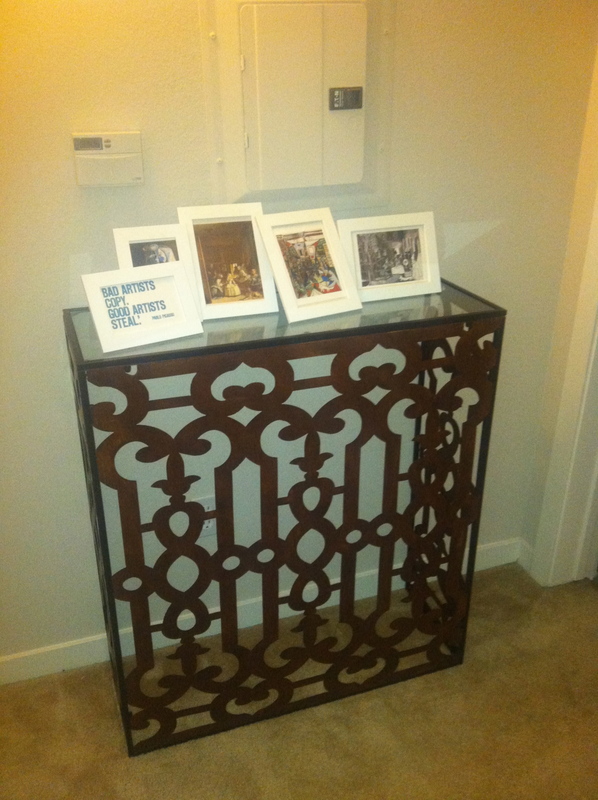 Love this Moroccan/Spanish inspired piece. I am going to change the photos I have up top, I think…but right now I have some of my favorite Spanish artwork (Velazquez’s Las Meninas and Picasso’s versions of them). On Sunday morning, I headed to West LA for a special group exercise class I was invited to, being put on by Fitist at Elliptifit. 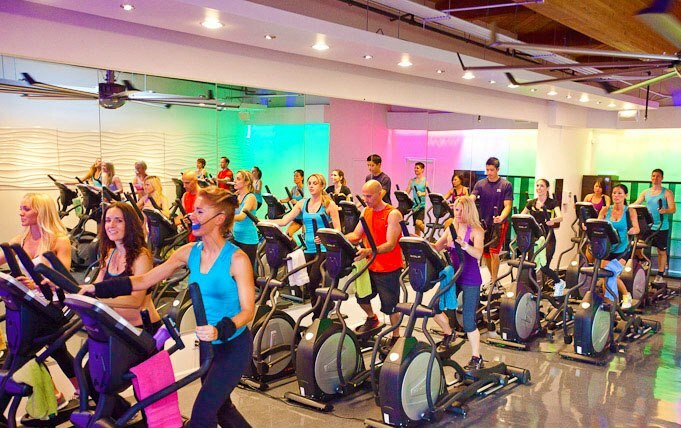 Elliptifit is like spin class – but on ellipticals. As a spin-o-phile, I was anxious to see if I would feel similarly about Elliptifit. I used to be a big-time elliptical user when I first started going to the gym. Now, I don’t use it very often – it’s not as fun or as effective for me as running or spinning. The 45-minute class sped by. The instructor, Annette, was very energetic and she had great music, but the workout itself wasn’t something I was completely enamored with. It was definitely more intense than if I had been doing an elliptical workout by myself. She told us when to sprint and when to climb, and what our resistance and ramp should be. We also did some isolated outer and inner thigh movements, as well as some arm work using the handrails. In 45 minutes, I covered 3.75 miles and burned over 500 calories. 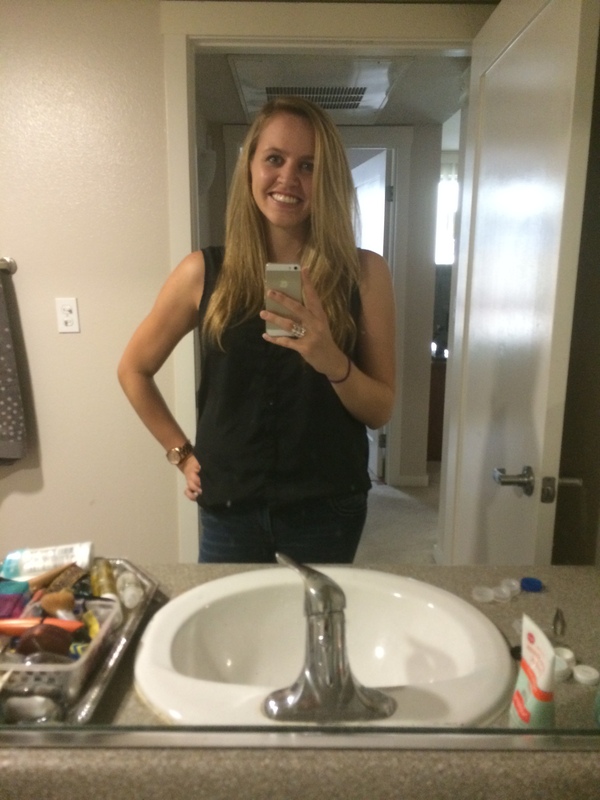 I felt like I worked out, broke a sweat, but since it was low impact it wasn’t too taxing. I enjoyed the new workout, but thankfully (for my wallet) I don’t think a new obsession was born. Since my externship ended, I am now in “finals mode.” Except I only have one final, and it’s two weeks away. That means plenty of time for being lazy…and working out a lot. Yesterday I took my friend Colleen to her first yoga class (ever) at YAS – and today I met up with my friend Armita there for a little lunch time spin. My arms and shoulders are feeling all of those chaturangas today. Speaking of spin, I’m making progress on my fundraiser for YAS-A-Thon. You can donate here, if you’re so inclined. Random question for any/all bloggers out there. That’s G is coming up on its 4th Birthday (seriously – whoa). I’m contemplating making a Facebook page and wanted to hear if you guys have any tips/tricks/suggestions for growing your blogs! 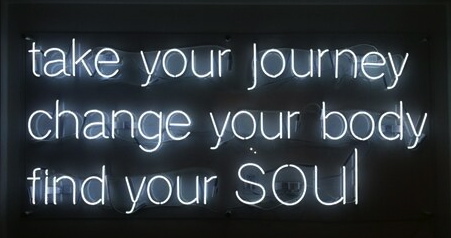 Last Thursday, Whitney and I took a Soul-Cycle class (with THE BEST instructor, Laura Crago). We dragged her boyfriend, Tyler, and Tyler’s BFF/our friend, Joe. Joe was a beast, and well, let’s just say two days later Tyler need icy hot delivered to him and had trouble putting on his shoes and socks. Poor guy. To break up the work day, we’ve been trying to eat at a variety of DTLA eateries. 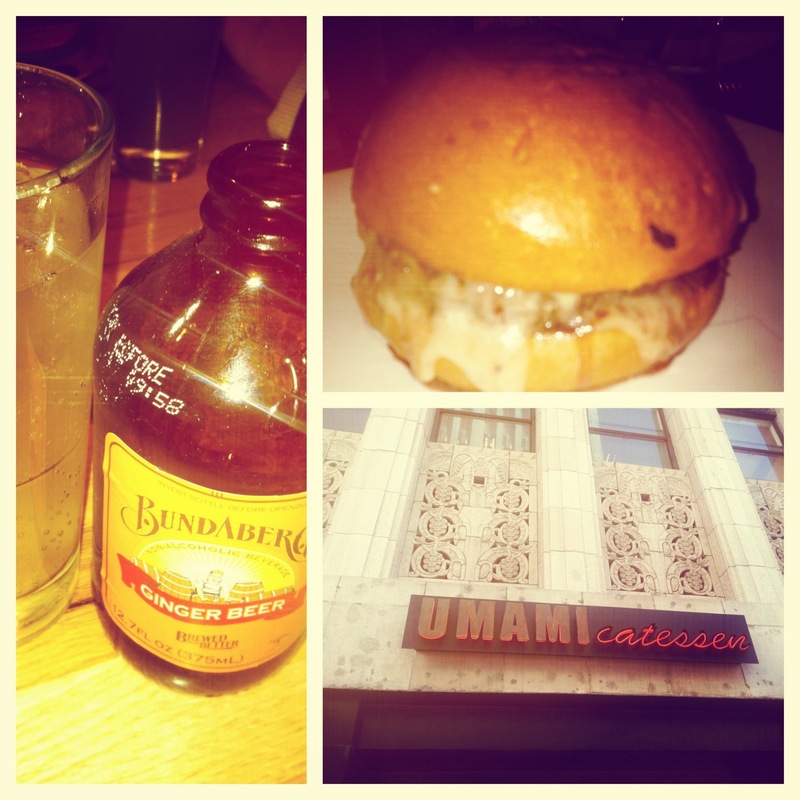 We tried UMAMIcatessen recently – and I loved the Truffle Burger. 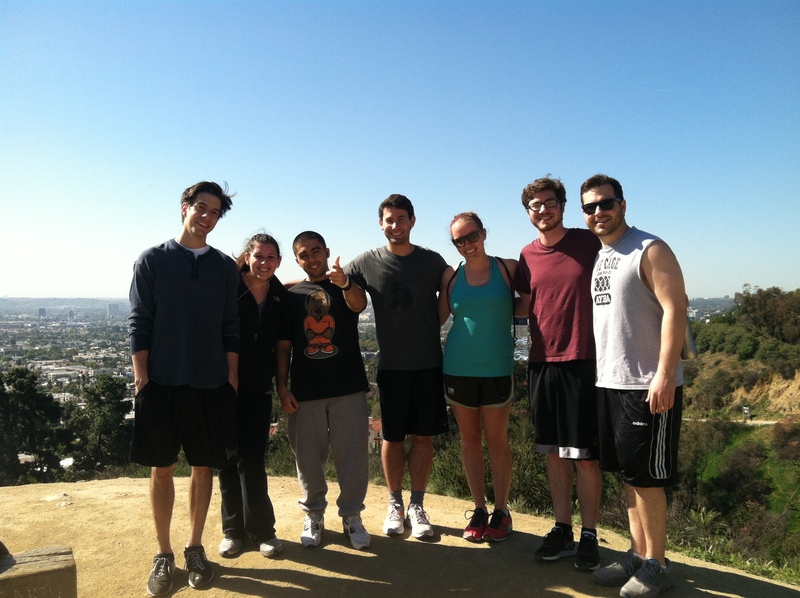 When I’m not moot court-ing on Sunday mornings, I try to join my buddies for a short Runyon Hike (and a mimosa or two afterwards…again, whoooops). They’re all trying to get in shape for our friends’ A.K. and Andrea’s wedding in July, so obviously I support the physical activity. 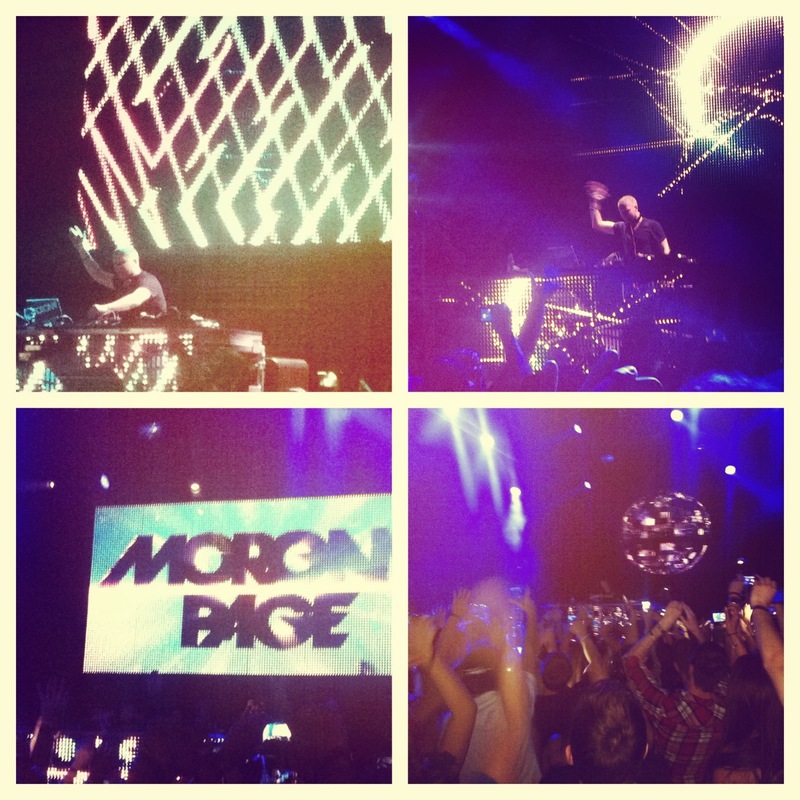 On Friday, Armita, Aviva, and I went to a concert – Adrian Lux and Morgan Page at Club Nokia. The show was great – I was SO happy when Morgan Page played my two favorite songs of his, Addicted and Body Work, one right after the other. 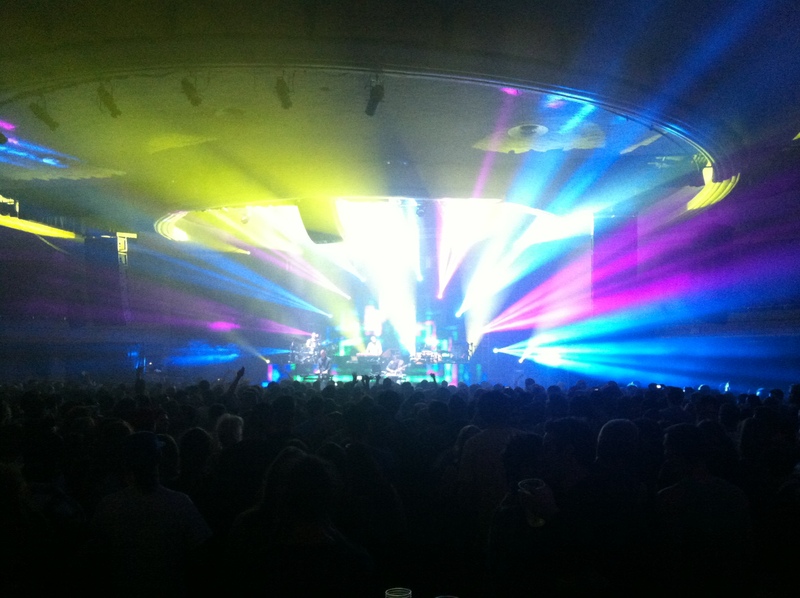 Later that night, Taylor, Armita, Aviva, and I grabbed dinner and went to a concert at the Hollywood Palladium – we saw Sound Tribe Sector 9. 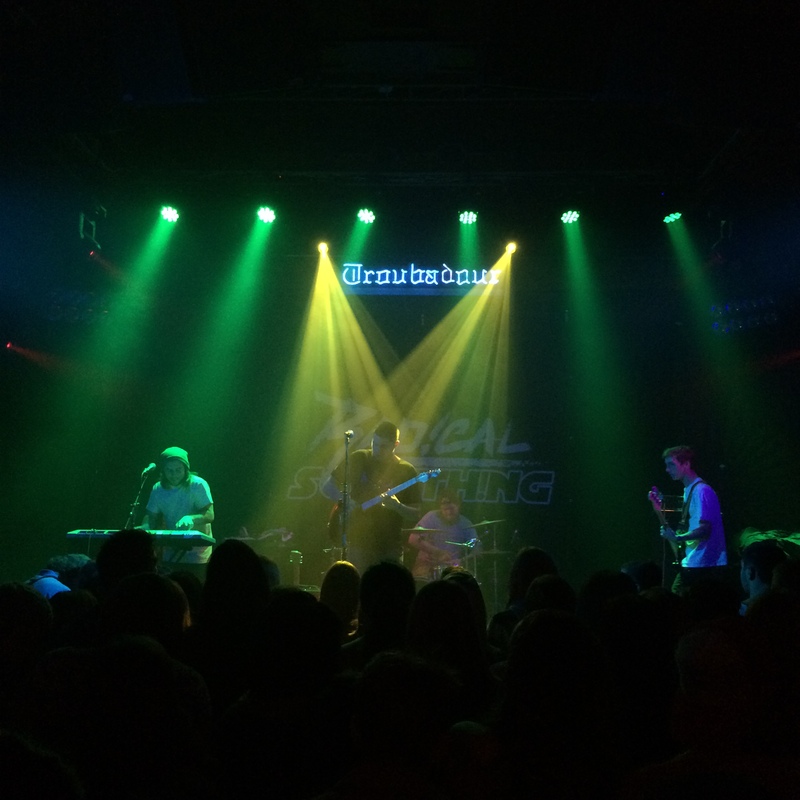 I’d never heard them before but really enjoyed their electronic/psychedelic rock vibe. 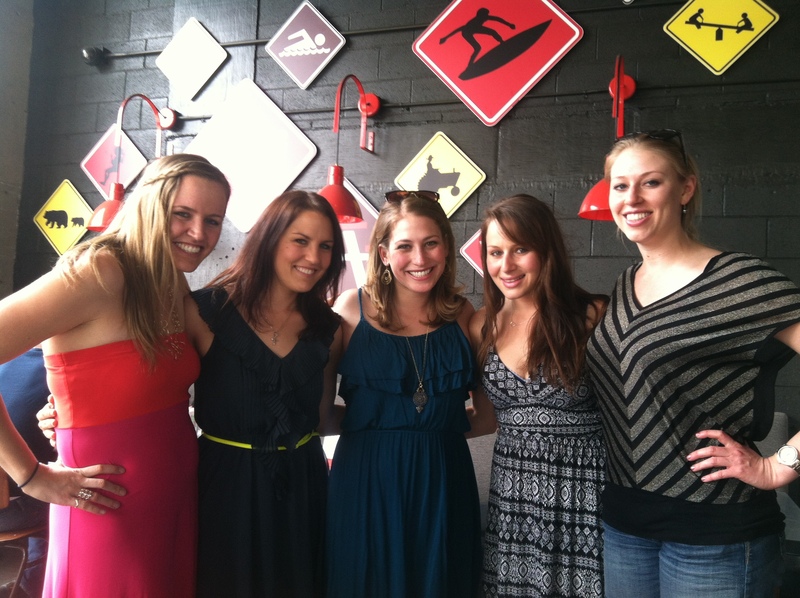 This was a fabulous weekend – but I am totally paying the price this week. Three cups of coffee at work today and I was still a zombie. My workouts are sucking this week, too, but I’ll try and get to bed early and try and un-shamble my life by the weekend. 1. Anyone ever have/throw a surprise party? Negatory on both accounts. I’m nosy AND not the best with secrets. 2. Best concert you’ve ever been to? 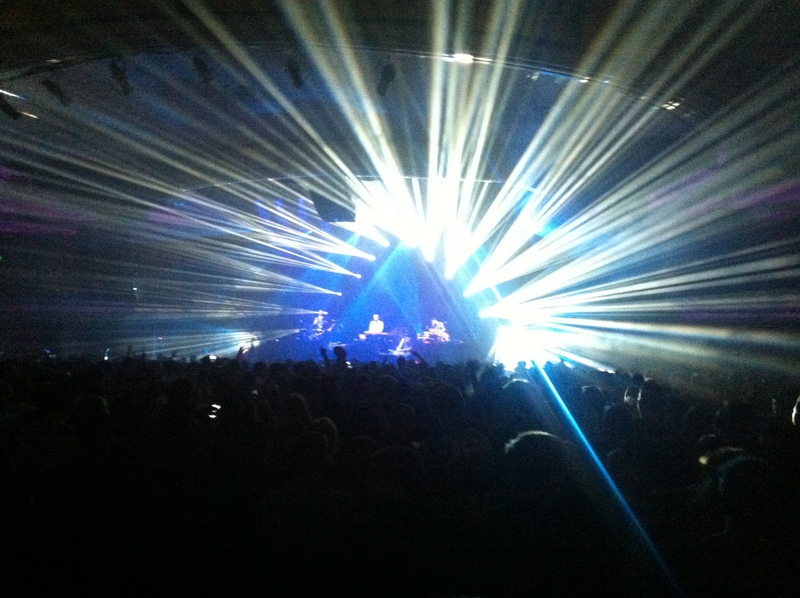 The first time I saw Girl Talk live might take the cake…or when I saw Passion Pit perform (before they were huge) the summer I interned at Chiat\Day. Hi blog world. I have gotten off track with two things that are important hobbies of mine: running and blogging…but that’s not to say I haven’t been busy doing a zillion things – both fun and academic. I figure, if I get caught up on my blogging, maybe my work out mo jo will come back too. In terms of school, we are rolling right along approaching finals territory. Yesterday, my friend Aviva and I had a graded interviewing and counseling session with a fake client for our Ethical Lawyering class. It was a weird experience – conducting a client interview with an actor – but probably helpful in the long run. I’ve also been working diligently on a note about a case, Fraley v. Facebook, as part of being a member of Loyola’s Entertainment Law Review. I’ve been able to incorporate references to Antoine Dodson and Kim Kardashian in my article, though, so that has been pretty entertaining in it’s own right. My other classes (Constitutional Law, Law of Sales, and Torts II) have been fine – some days are more interesting than others, that’s for sure. One cool thing about law school is the wide array of guest speakers that come through. In the last two weeks, I have been able to attend three really impressive lectures. 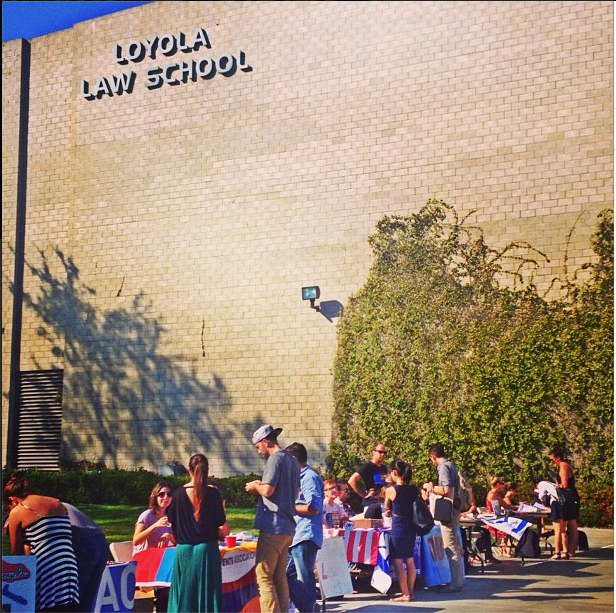 The first one was a presentation called “Hamlet for Attorneys” given by Loyola alum Judge Gregory Alarcón. Alarcón is obsessed with Shakespeare and realized that Hamlet in particular has a lot of lessons that can be applied to being a successful trial lawyer. I really enjoyed the presentation and decided to try and read Hamlet again. A few days later I was able to hear Frank Gehry, the architect who designed Loyola (and also my favorite architect of all time). He was charming and funny, and just from hearing him speak for 45 minutes definitely revealed his status as an innovator. Finally, last night I got to hear one of the DAs on the OJ Simpson case, William Hodgman, discuss the process of jury selection, and to some extent, what went wrong for the prosecution in that case. I remember being really young when all the OJ stuff was happening, but this definitely made we want to go back and read more about it. When I haven’t been nerding out, I have been gallivanting around LA a fair amount. 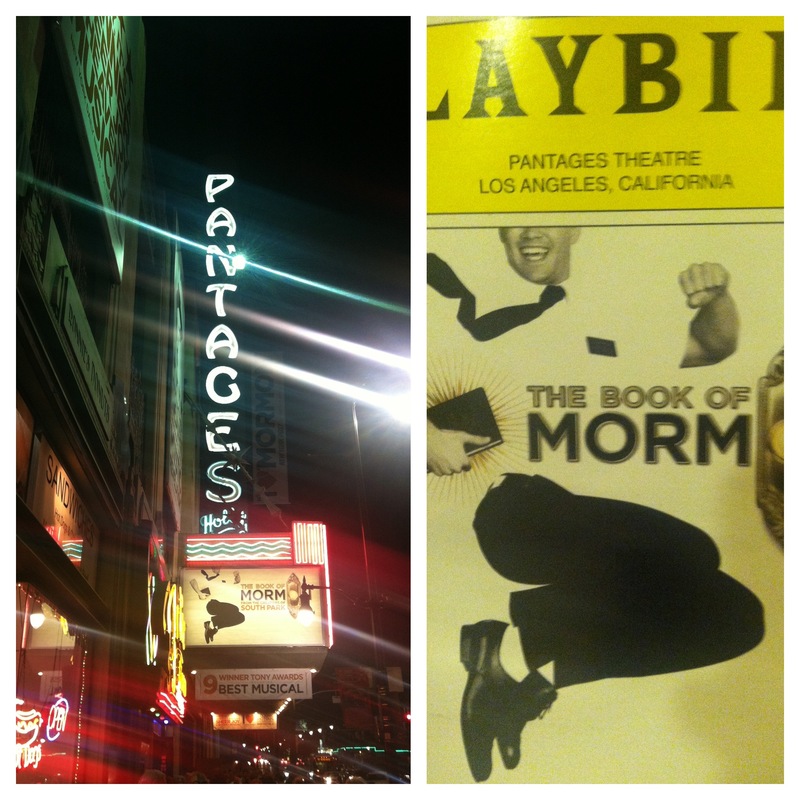 Last Friday, I was able to see Book of Mormon at the Pantages. IT WAS INCREDIBLE. I have been incessantly singing my two fav songs since (Hasa Diga Eebowai and I Am Africa). Offensive? Sure. BUT AWESOME. On Saturday, I took my buddy Kayvan up on an invite to go to the USC v. Oregon game. 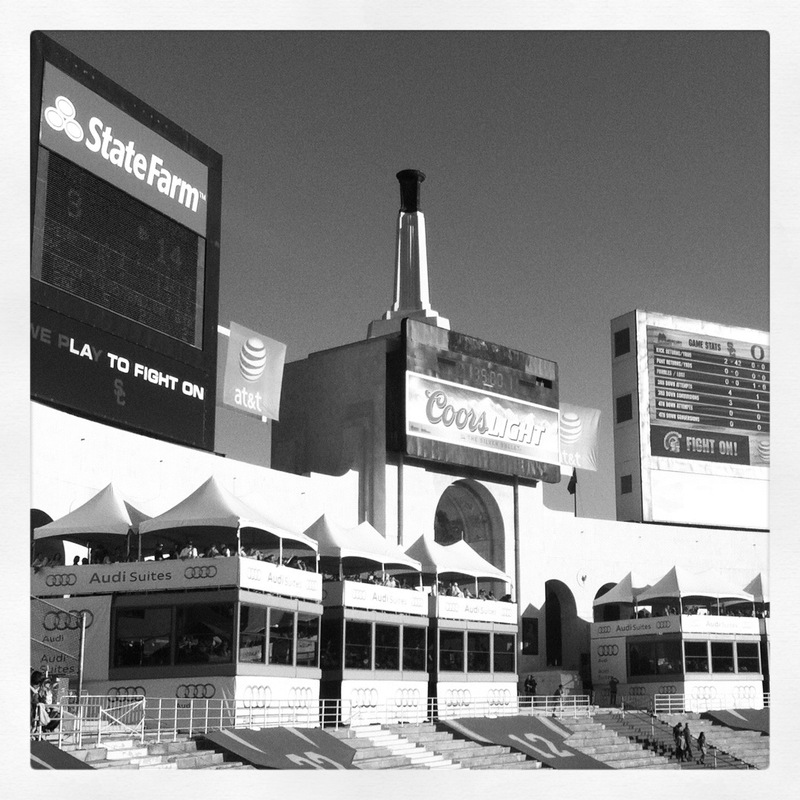 Tailgating was a lot of fun – and games at the Coliseum are always a good time…even if I wasn’t too concerned about the outcome of the game. #calfootball. 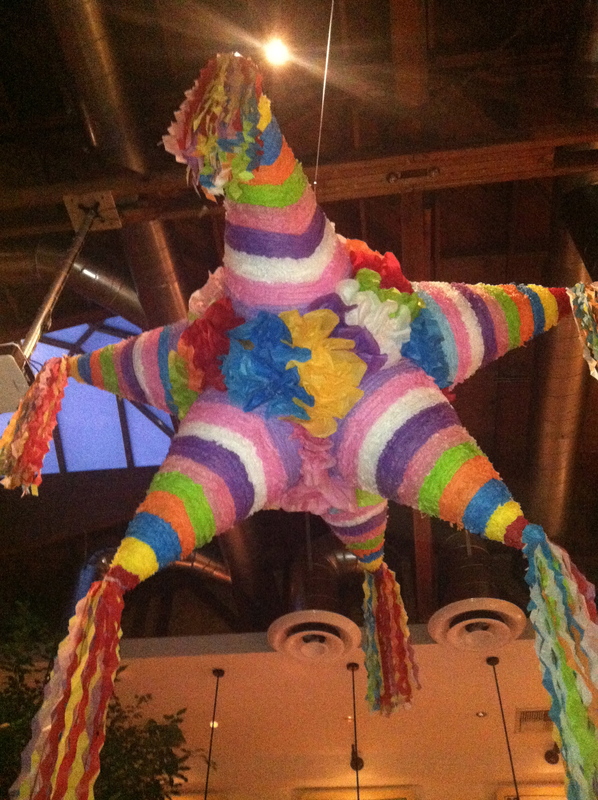 Last weekeend also included a lot of Mexican food – two trips to Border Grill and one to Lotería Grill…whoa nelly). 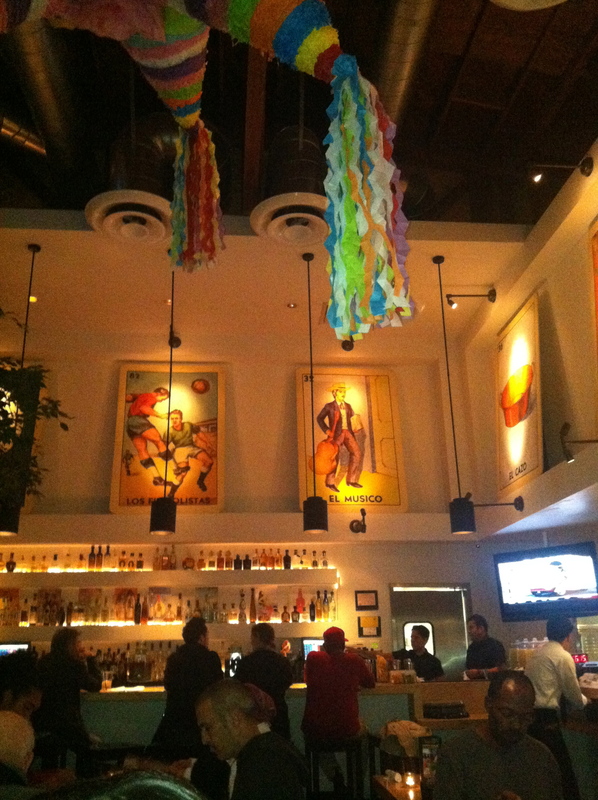 I loved the cute interior at Lotería. 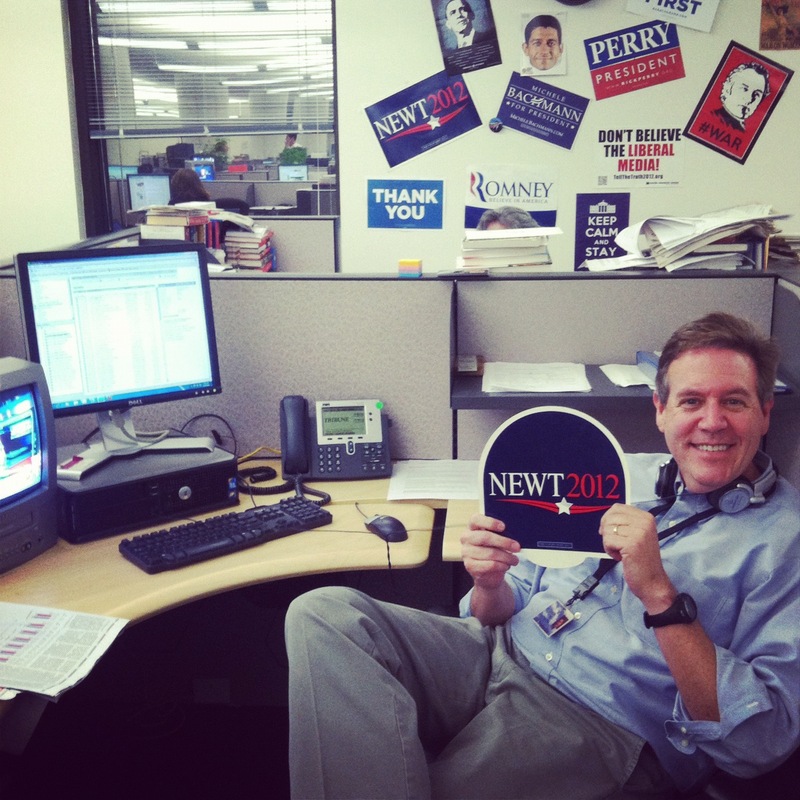 As everyone is well aware, we re-elected Obama on Tuesday! It was exciting, but not nearly as exciting as last year. I stopped by the LA Times Tuesday night to say hi to my Dad, and to see how things were going in the newsroom…and then my mom and I hopped across the street for dinner at Pitfire. Also worth mentioning: I have been taking advantage of sales on various online shopping vendors lately. I recently fell in love with Madewell, thanks to my friend Armita. These gems arrived yesterday. And this is coming from J. Crew. Yay, sales! (I miss rebajas in Spain so much). In terms of my workouts, I have been sort of in a plateau lately. After the NWM 13.1, I had about a week of pretty bad hip and IT band pain, but it has since dissipated. I have been running and hitting the gym, just with less gusto than usual. It is also the time in the semester where I am having to spend more time in the library, so that has shifted my priorities as well. 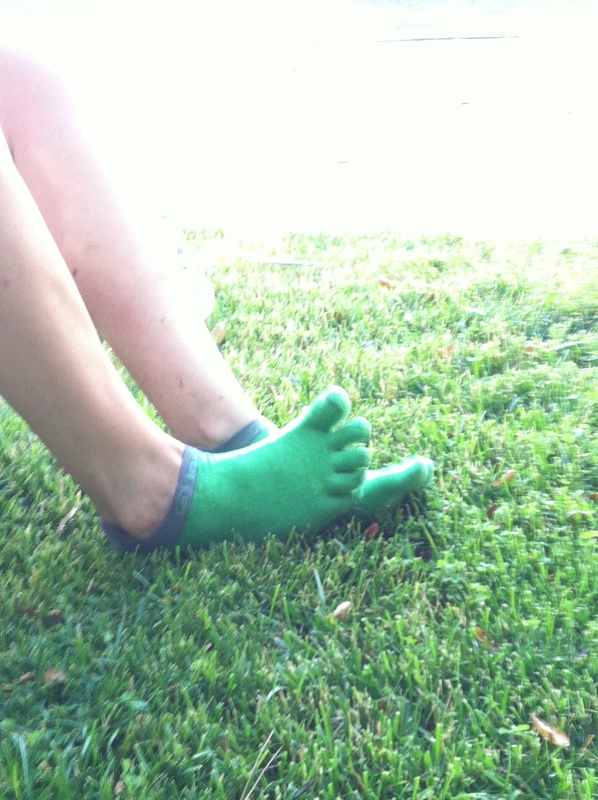 I have a couple of fun 5ks coming up, so I am hoping that these kick me into gear. How do you beat the workout blahs? 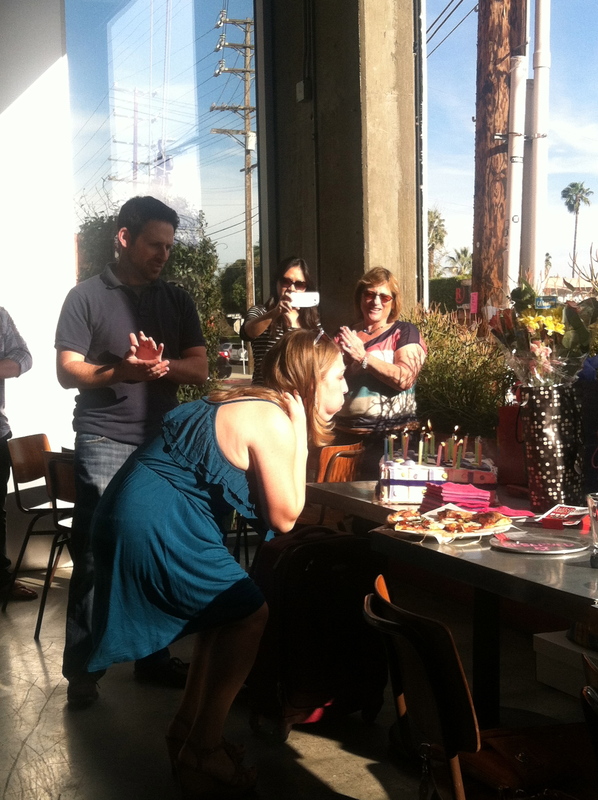 I had an unexpectedly eventful Friday the 13th – and not in a creepy way that one might expect. 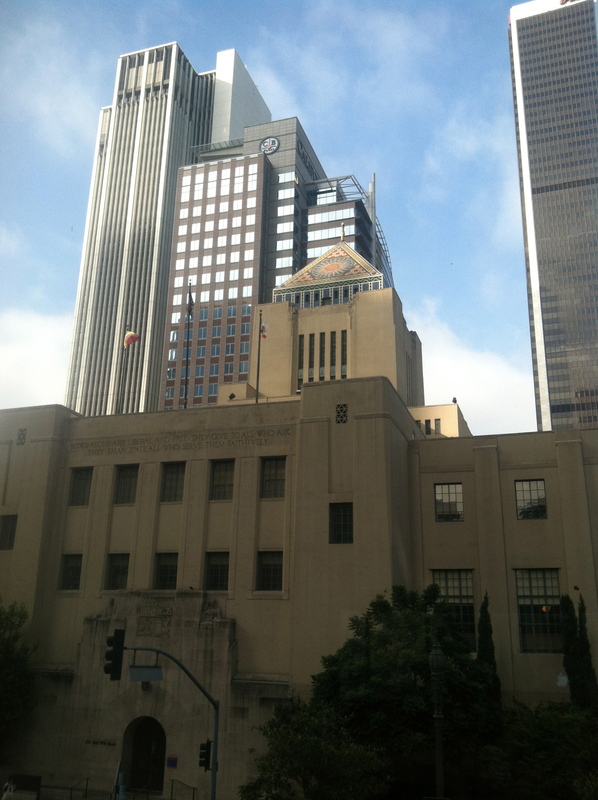 The day started with my typical morning at the Criminal Courts Building. For lunch, our judge and all of his courtroom staff (bailiff, clerk, court reporter, Deputy DA, and the public defender assigned to his room, plus the externs) all went out to lunch at the local (delicious) pizza place, Pitfire Artisan Pizza. I’d been there a few times before, and this time I chose a pizza off their list of specials. 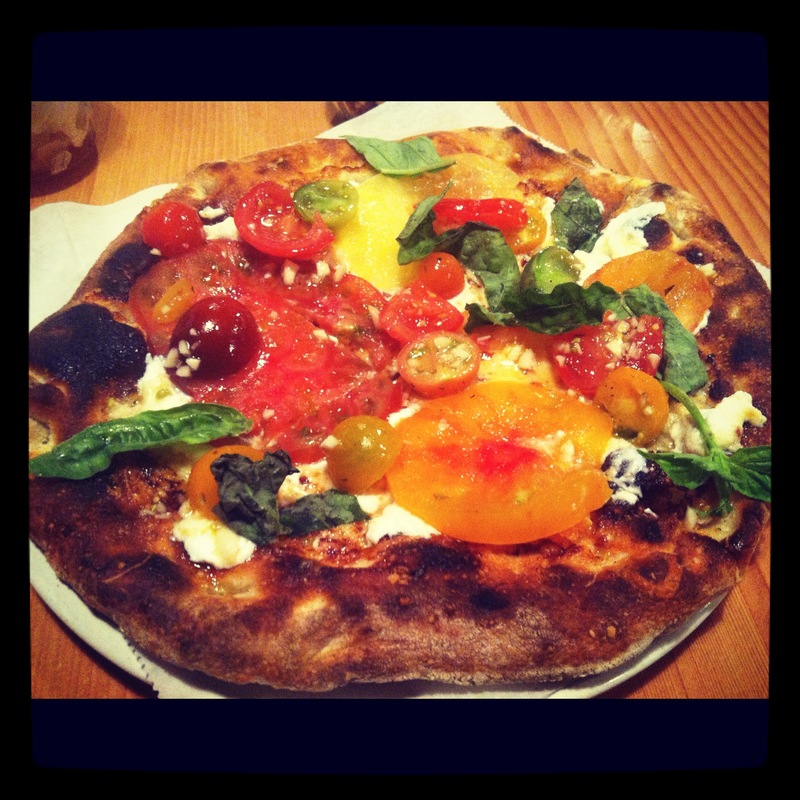 You can literally never go wrong with heirloom tomatos. After work, I hopped over to the gym for a low-key 3 mile run on the T-mill and then another (low-key) swim workout (800 m total). Pool etiquette: I am relatively inexperienced and new at this whole swimming for exercise thing, but I am pretty sure lap pools are meant for swimming laps and not for monkey in the middle games played by pre-teens, or as a wading pool for middle-aged men. Does anyone else experience this at their gym? I am totally fine sharing a lane with someone, but I feel like the other person should be swimming. If not, get outta the pool. Heel stomping? I’ve had some weird knee, shin, and top-of-foot pain this week, and I am fairly certain it is from stomping around downtown LA all week (summer?) in heels. Any remedies for this? Anyway, I left the gym and met my mom for dinner. We walked over to Café Pinot, a lovely little outdoor spot at 5th and Grand. I felt like we were eating in NYC’s Bryant Park, except for that whole still being in LA thing. This place was super nice – what you’d call “bougie” even. I was not up to snuff in my cut-off shorts, post-pool hair, and lack of make-up. Living in LA for the win! Love that casual style rules all. #yessss. My mom had a few hours to kill before carpooling home with my Dad (he worked the late shift) so we relaxed over a nice dinner. My mom ordered a Spanish wine (love that she’s a converted Spain-o-phile). Her wine was Monte Oton, Grenache, Borja, Spain. I didn’t know much about Borja (or even where it was). Kaley over at Y Mucho Más is the Spanish wine expert. My mom’s (super colorful and tasty) meal was actually an appetizer. She ordered the house cured citrus salmon [rainbow carrot confit, red onion, juniper berry gastrique, fingerling potatoes, crème fraîche]. One day I will know what a “gastrique” is. Today is not that day. I stuck to tradition and went with a Green Flash West Coast IPA. The waiter asked if I’d tried this one before, to which I replied “hah. 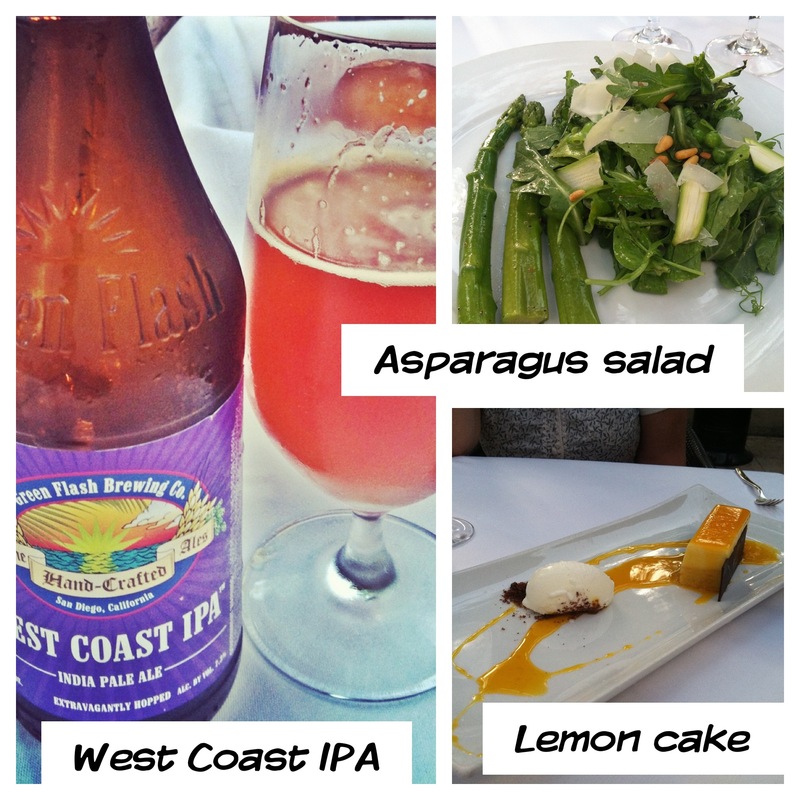 I’m an IPA fanatic.” I had a heavy lunch (see pizza, above) so I noshed on the asparagus salad. My mom and I eyed our neighbors’ desert and knew we had to have it, so we split the lemon cake at the end of our meal. We’re both suckers for ANYTHING lemon, and the addition of mango and passion fruit flavors were clutch. Overall, I really liked Café Pinot. The flavors were super inventive and seasonally appropriate. The restaurant itself was a little more uppity than I like – especially for downtown, but the food and service lived up to the refined, high-class air. After dinner, I headed to meet up with Aviva and Armita for a random but fun night. crazy, monsoon-like weather produces this. 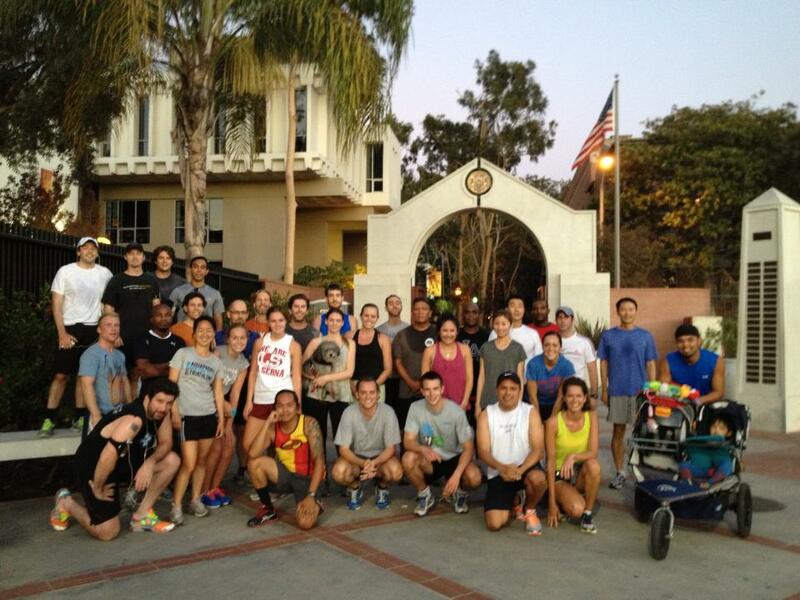 First, we headed to the Culver Hotel in Culver City. Downtown Culver City is adorable. Aviva had recently been to this place and noted their live jazz – each night they have something different going on. We need to go back for the 30’s Jazz night, as well as the contemporary stuff. 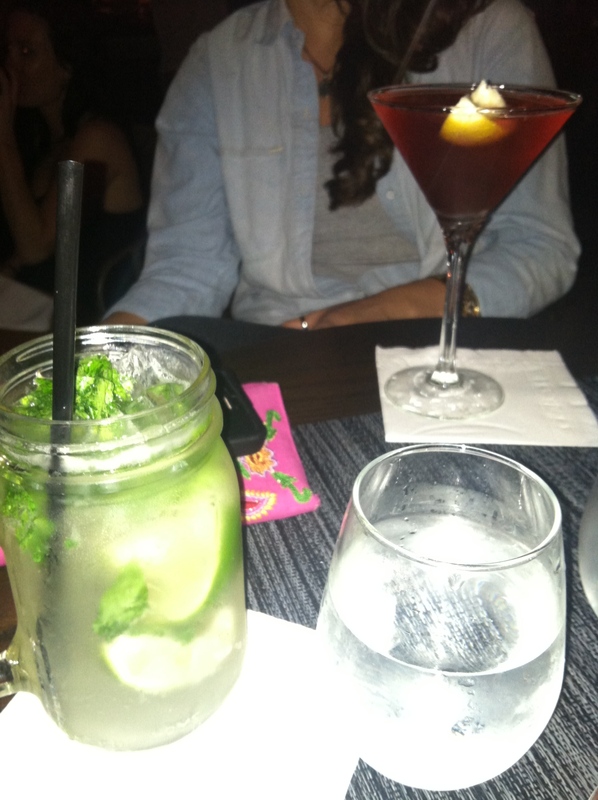 This place was awesome – really great vibe, music, and delicious drinks. 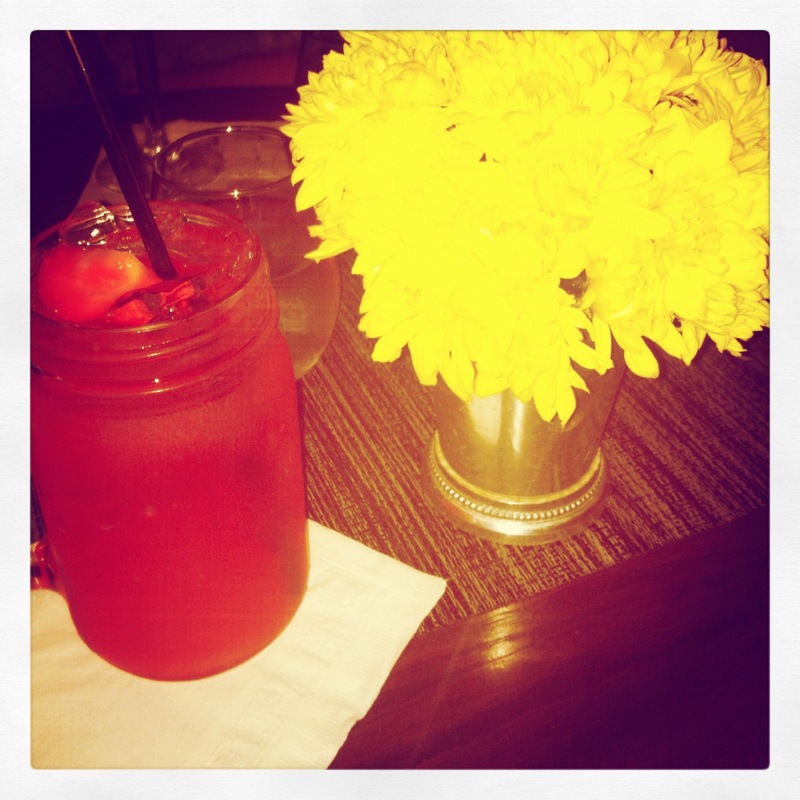 I indulged with the waitress’ rec, the “red slipper” which was comprised of Absolut wild tea vodka, Beefeater gin, sweet and sour, Agave nectar & strawberry puree. Living dangerously pays off, this thing was incredible. possibly better than the dorothy of oz version. Aviva sipped an original mojito, and Armita went with a “flirtini.” Despite the girly name, this thing packs a punch – vodka, champagne, and a little cranberry juice. 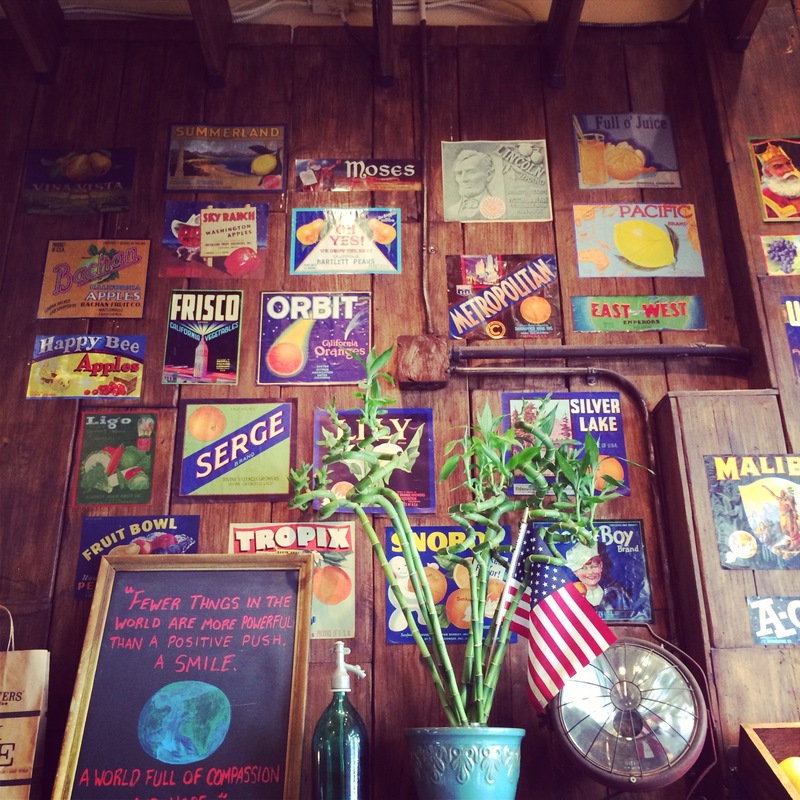 Definitely worth a stop anytime you’re in Culver City! After our drink at the hotel, we headed further west to a live music venue in Santa Monica called Central: A Social Aid and Pleasure Club. One of Aviva’s childhood friends is now an electronic music artist (!) so I was stoked to check it out. The venue looked sketch from the outside but was truly awesome. It reminded me of some of the smaller bars in Madrid’s Malasaña district – with its quirky, indie vibe. We caught up with some of Aviva’s friends – including Charlie, aka the artist known as sahy uhns. (apparently pronounced “science,” which I think is pretty cool). His technique is also uniquely cool as well (love this article). 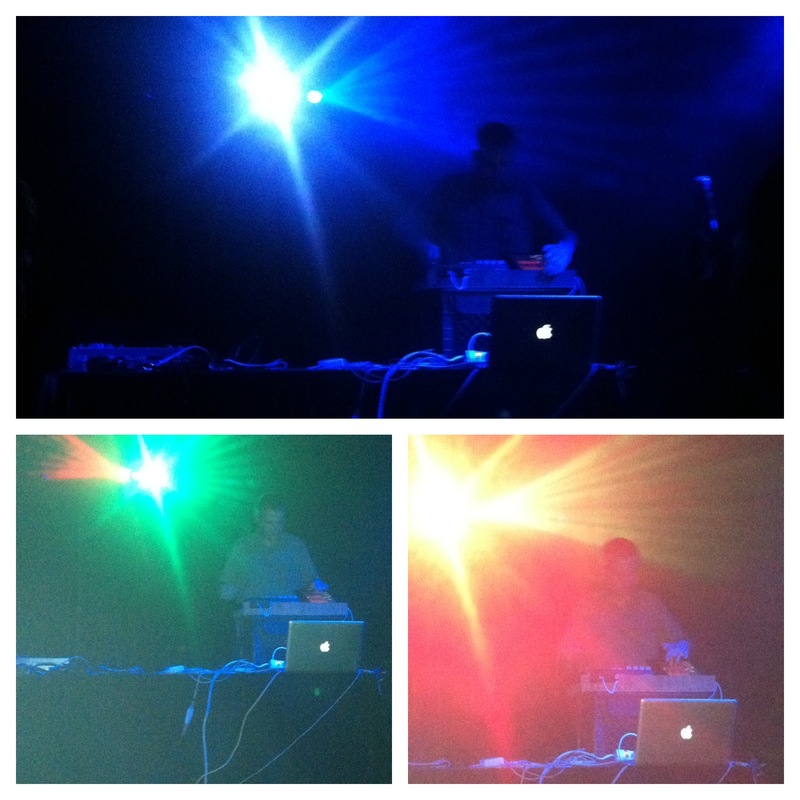 I really enjoyed his set! It was described to me as “intelligent dance music.” Definitely worth a listen (here) if you’re into this stuff. 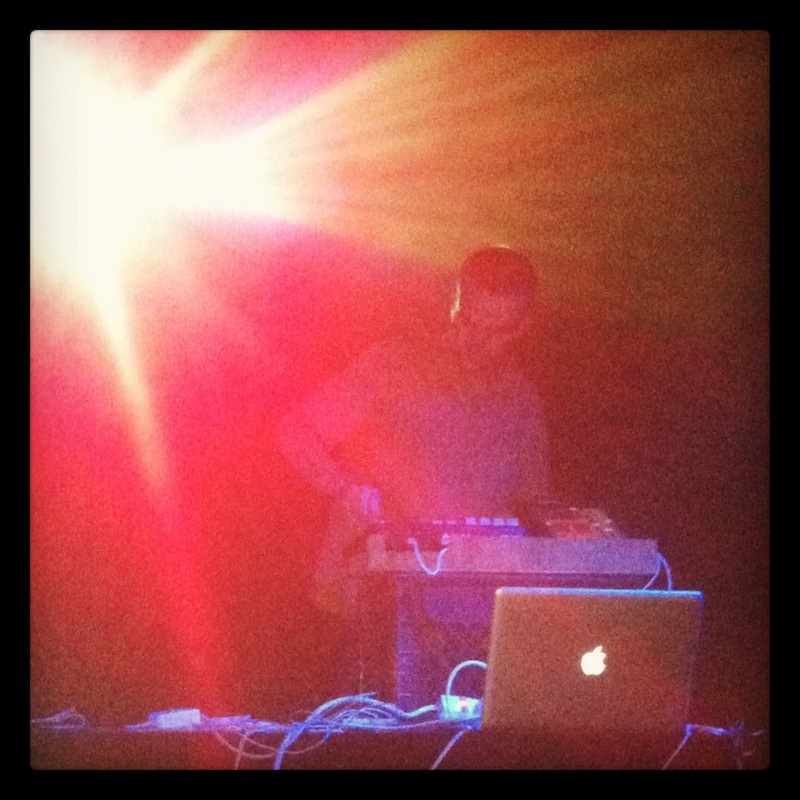 I definitely want to go to more shows (possibly his next show on Monday at The Echo). I was also stoked to learn that The Hood Internet is coming to Central in August! Boom! By the time the night was over, we were all hungry so a stop at Swingers for some mac n cheese and sweet potato fries was key. I went to bed super sleepy, but from a fun-filled Friday. I have also been listening to say uhns and The Hood Internet all day, too. #sorryimnotsorry You should too. Have you discovered any new venues or artists lately? Hi everyone! 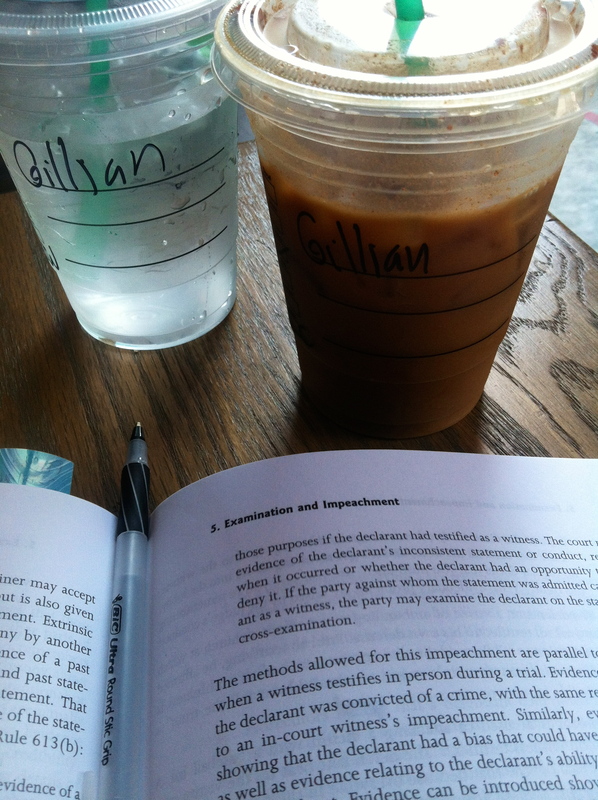 I'm Gillian - attorney by day, fitness fanatic by morning and night. 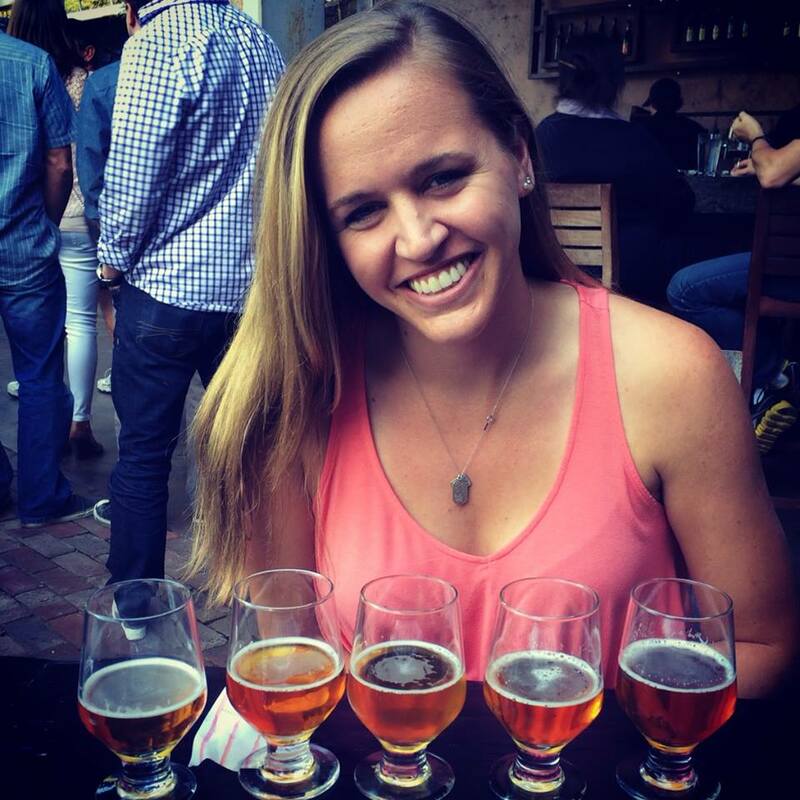 Lover of IPAs and Los Angeles. taking a rest day: it’s okay. fitness friday: a pre-weekend workout tip. 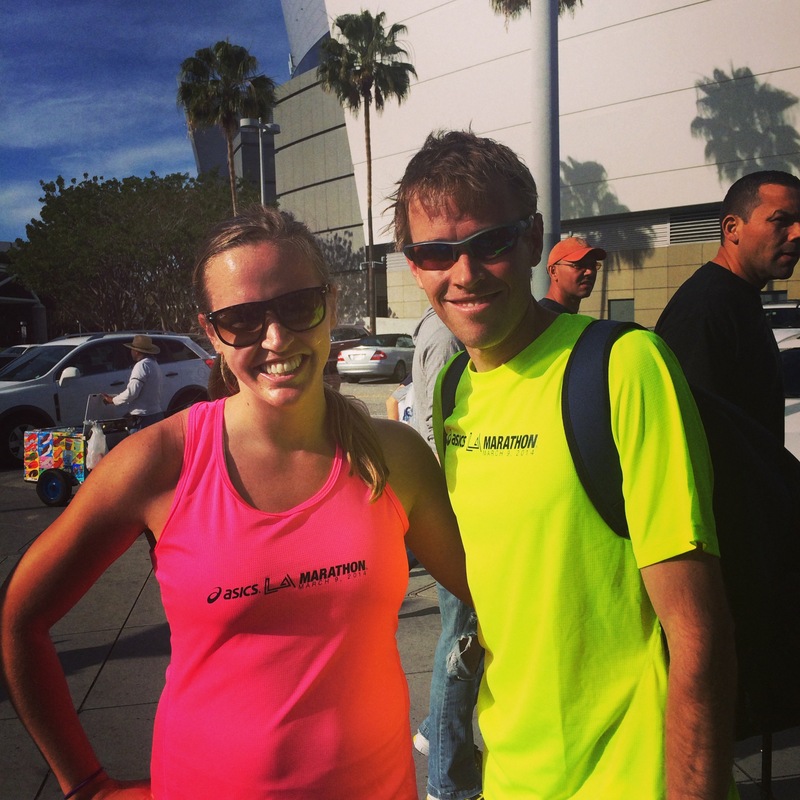 Hanging out with Ryan Hall before the 2014 LA Marathon.